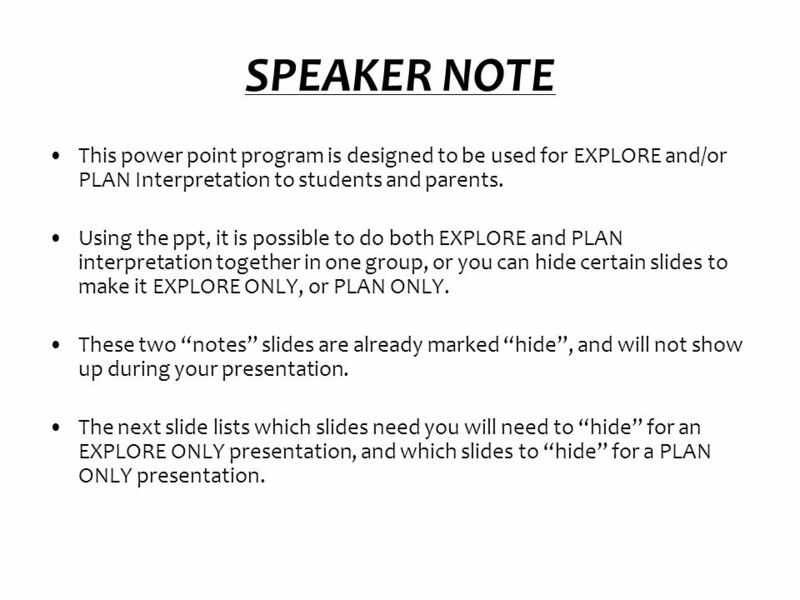 2 SPEAKER NOTE This power point program is designed to be used for EXPLORE and/or PLAN Interpretation to students and parents. 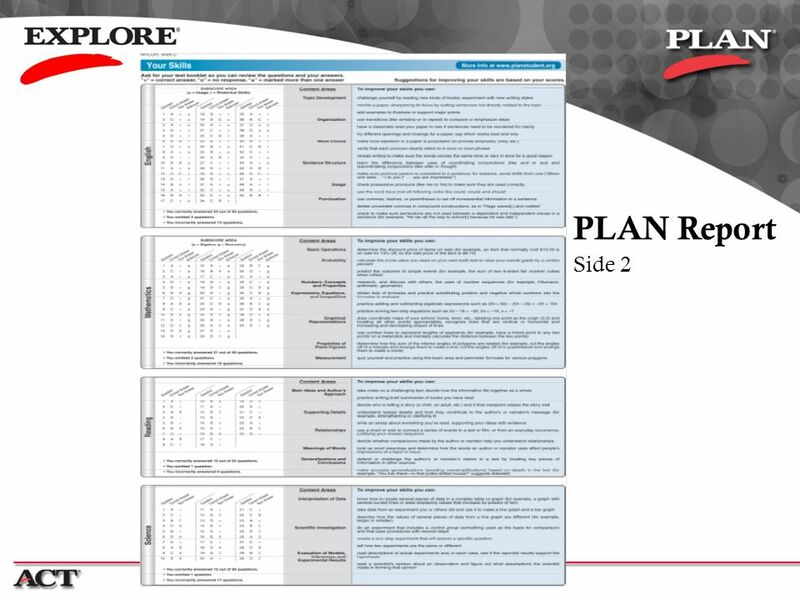 Using the ppt, it is possible to do both EXPLORE and PLAN interpretation together in one group, or you can hide certain slides to make it EXPLORE ONLY, or PLAN ONLY. These two “notes” slides are already marked “hide”, and will not show up during your presentation. 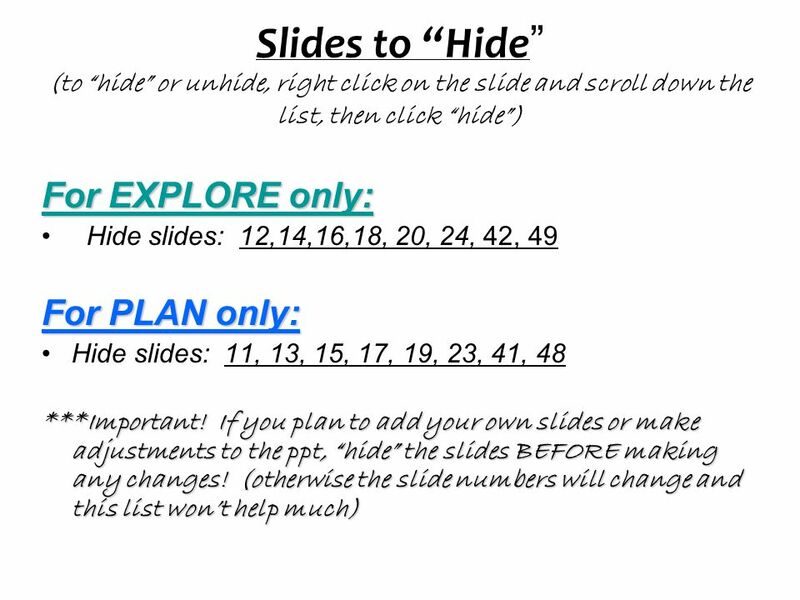 The next slide lists which slides need you will need to “hide” for an EXPLORE ONLY presentation, and which slides to “hide” for a PLAN ONLY presentation. Are YOU Ready? 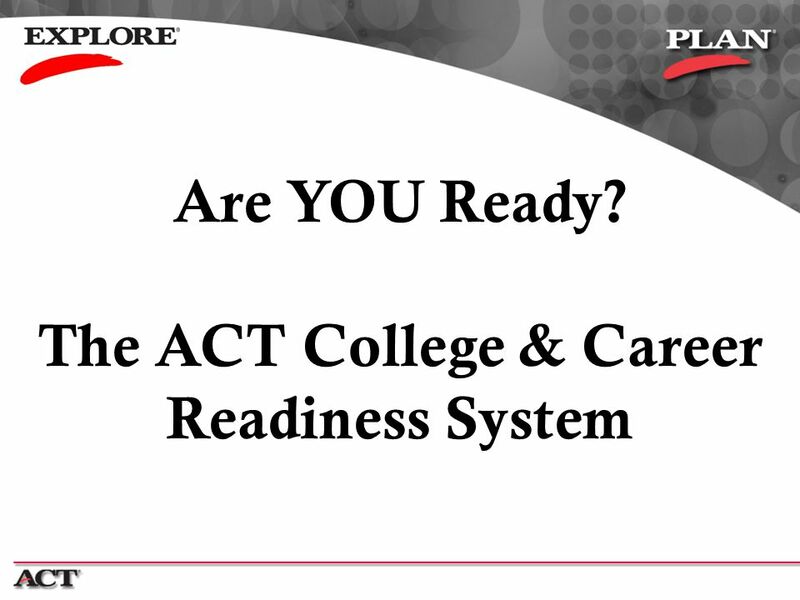 The ACT College & Career Readiness System 8th Graders: Are you ready for high school? Do you know what courses you need to take? 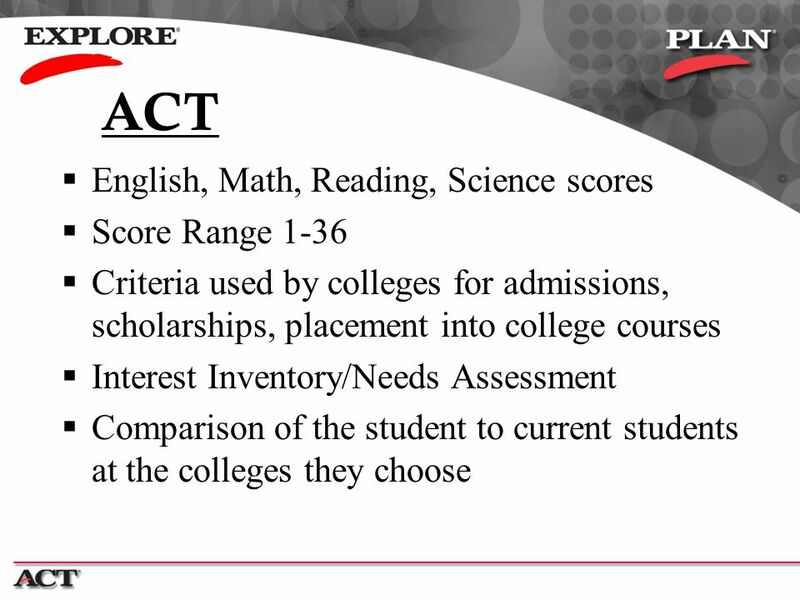 Did you know that you already have an “ACT” Score? 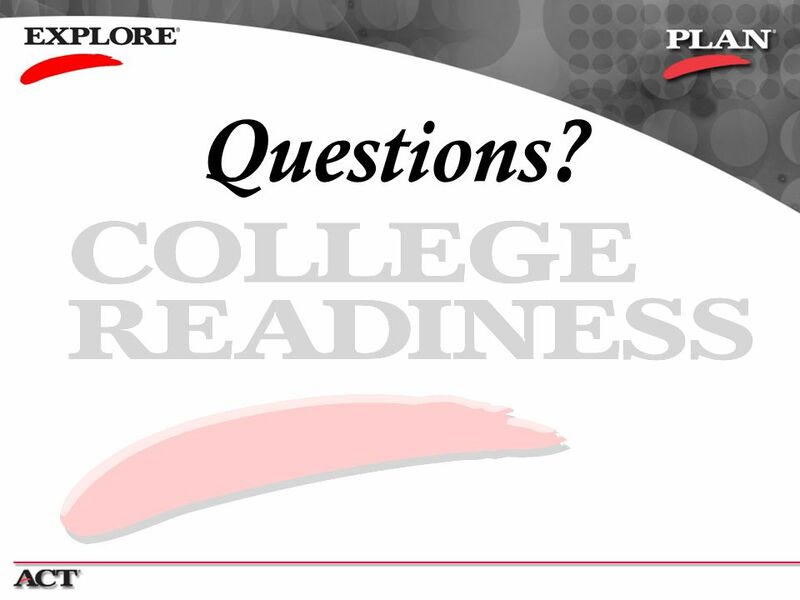 10th Graders: Are you on the way to being College-Ready? Are you taking the right courses? 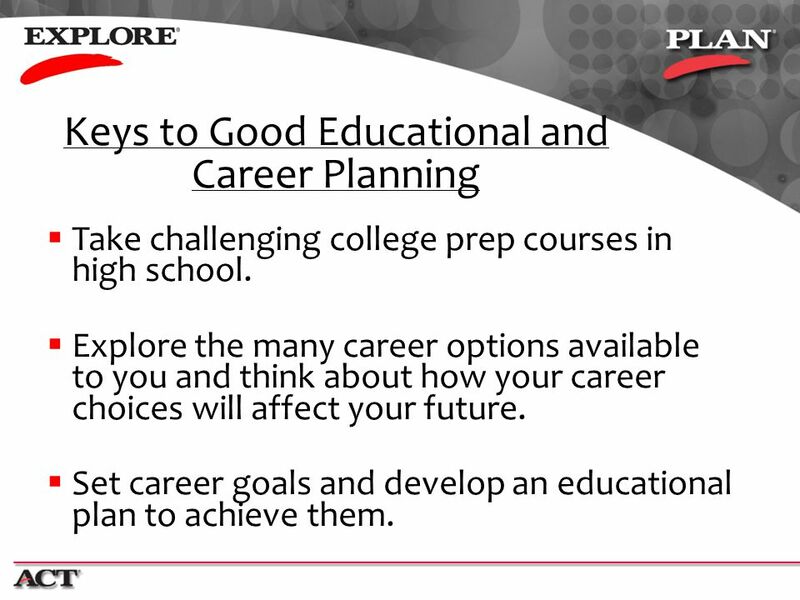 Do you have a plan for after high school? 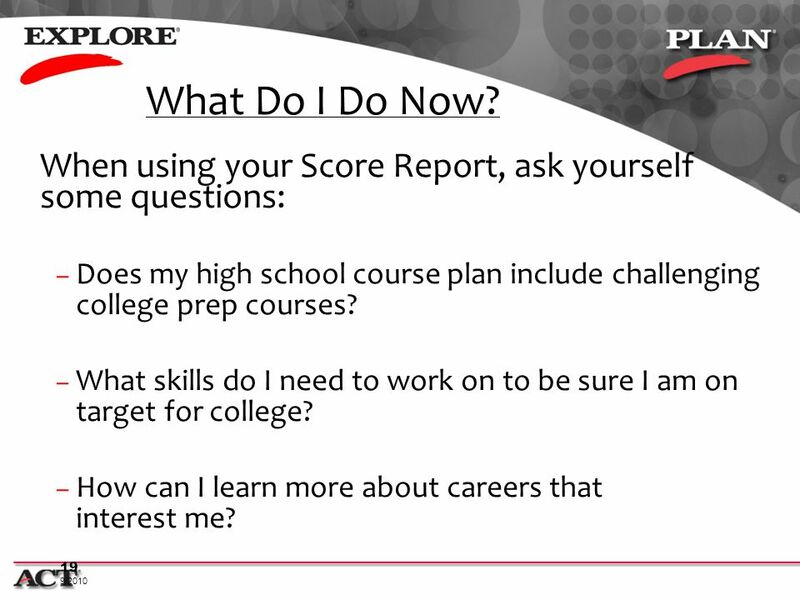 Do your grades and scores show that you are on track to be ready when you graduate? What do you want to do after high school? And what will it take to get there? 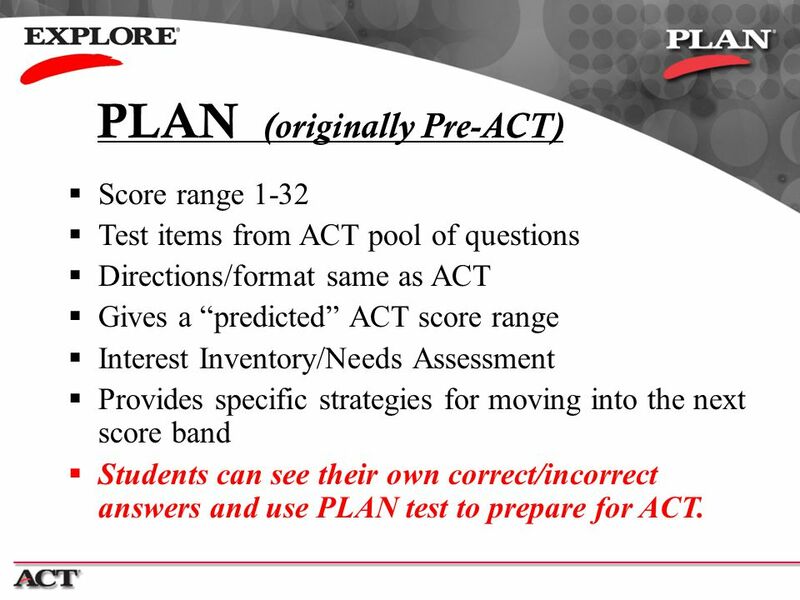 Test items from ACT pool of questions Directions/format same as ACT Gives a “predicted” PLAN score range Interest Inventory/Needs Assessment Provides specific strategies for moving into the next score band Students can see their own correct/incorrect answers and use EXPLORE to prepare for PLAN & ACT! Notes are in the slide. 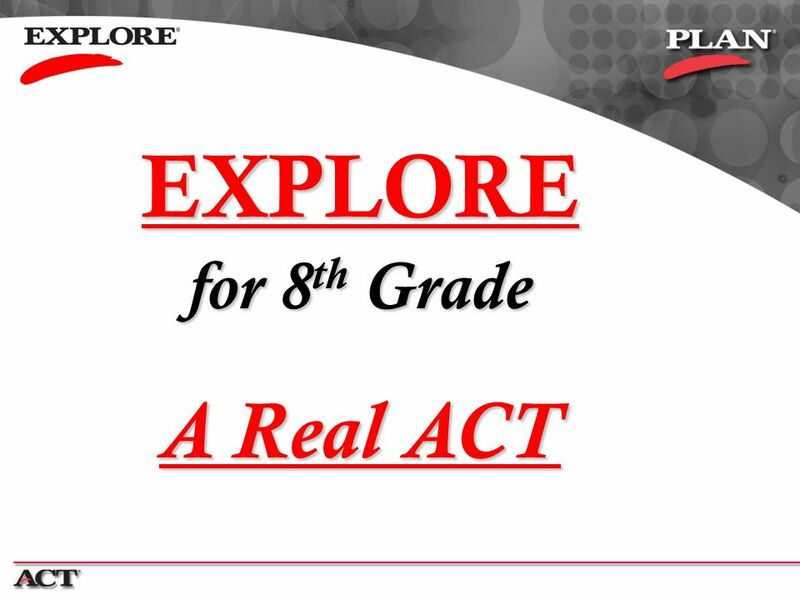 EXPLORE can be taken by 7th-8th-and 9th grade students. 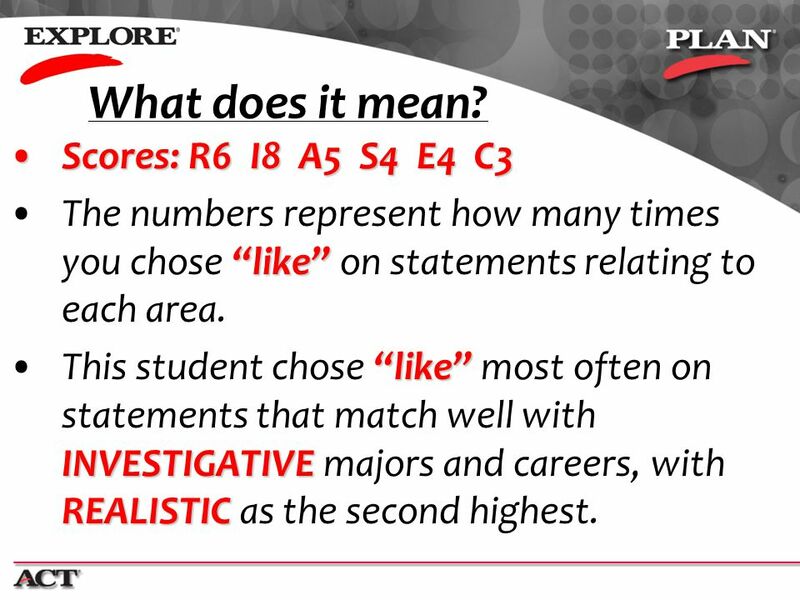 It has real ACT questions and your score is “equated”, meaning that your EXPLORE score represents what you would probably have scored on a regular ACT had you taken it instead, *with the same effort and attitude toward the test. 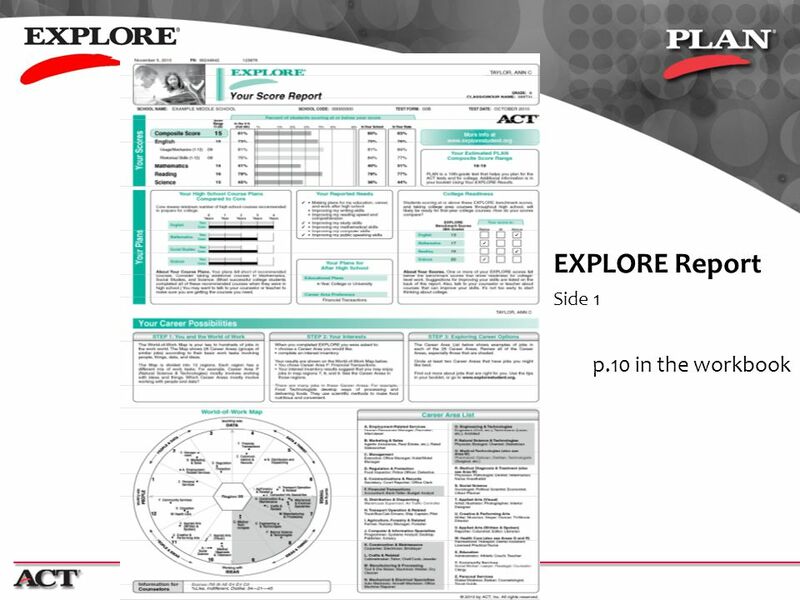 Your EXPLORE score gives you a very good idea of how you would compare with seniors who are taking the ACT and headed for college. 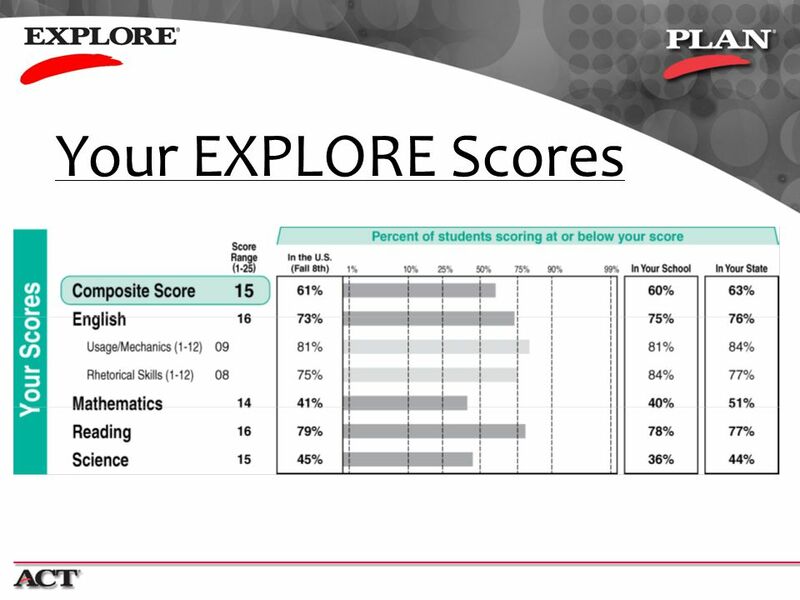 Knowing that score early gives you a chance to make a difference in your performance…take harder classes, study more, work on the areas where you need to improve! 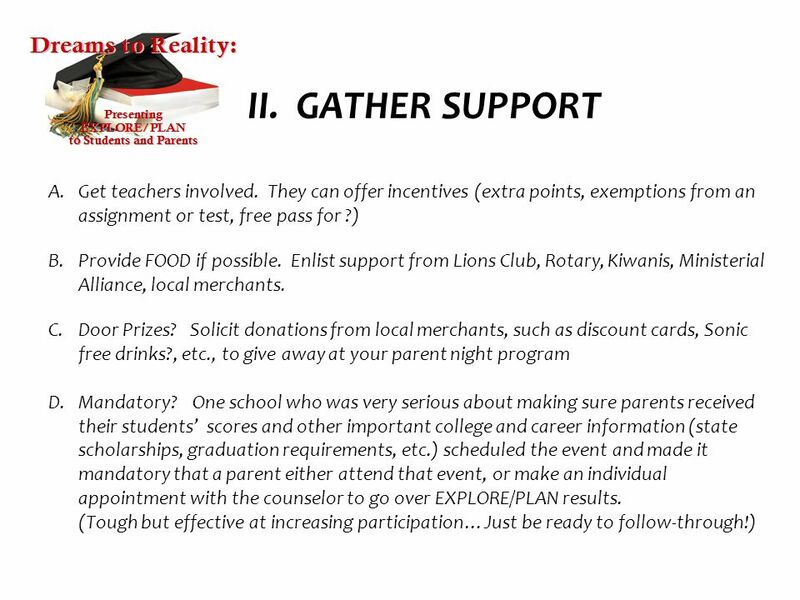 PLAN can be taken by 9th/10th grade students. It has real ACT questions and your score is “equated”, meaning that your PLAN score represents what you would probably have scored on a regular ACT had you taken it instead, *with the same effort and attitude toward the test. 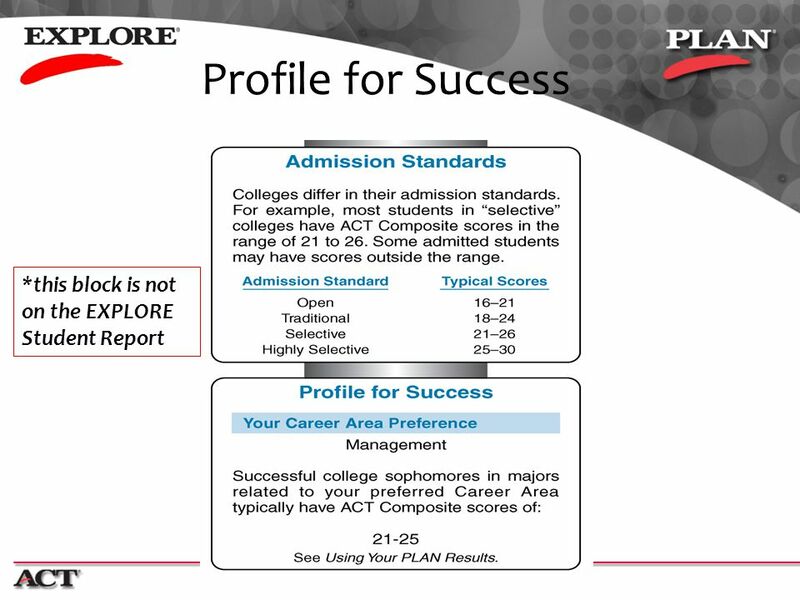 Your EXPLORE score gives you a very good idea of how you would compare with seniors who are taking the ACT and headed for college. Knowing that score early gives you a chance to make a difference in your performance…take harder classes, study more, work on the areas where you need to improve! This is what your EXPLORE Score Report looks like. 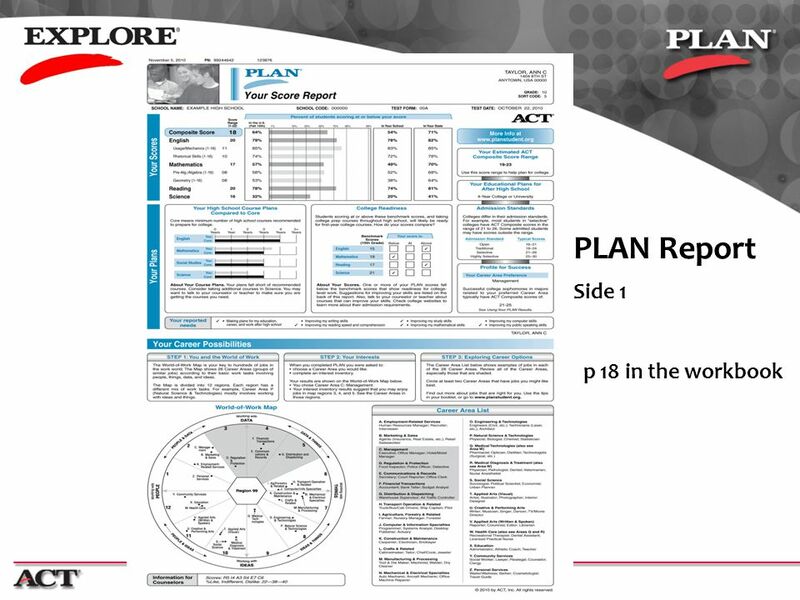 This is what your PLAN Score Report looks like. 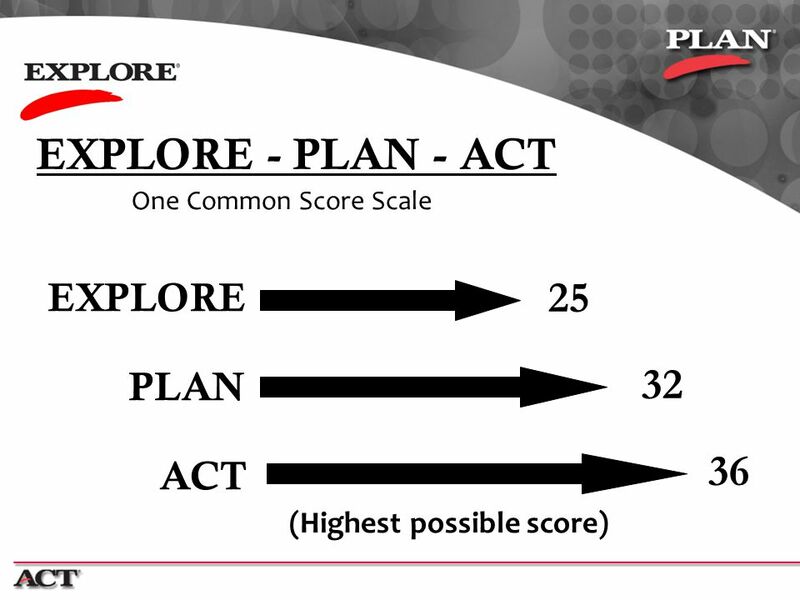 Your Estimated PLAN score gives you an idea of where you MIGHT score on PLAN, in 2 years, IF you keep doing what you are doing now in terms of course-taking, effort, and learning. If your Estimated Score is lower than you want it to be it is NOT carved in stone! Make choices that will increase that score, like challenging coursework, 100% effort, and doing extra activities to practice and prepare for ACT. 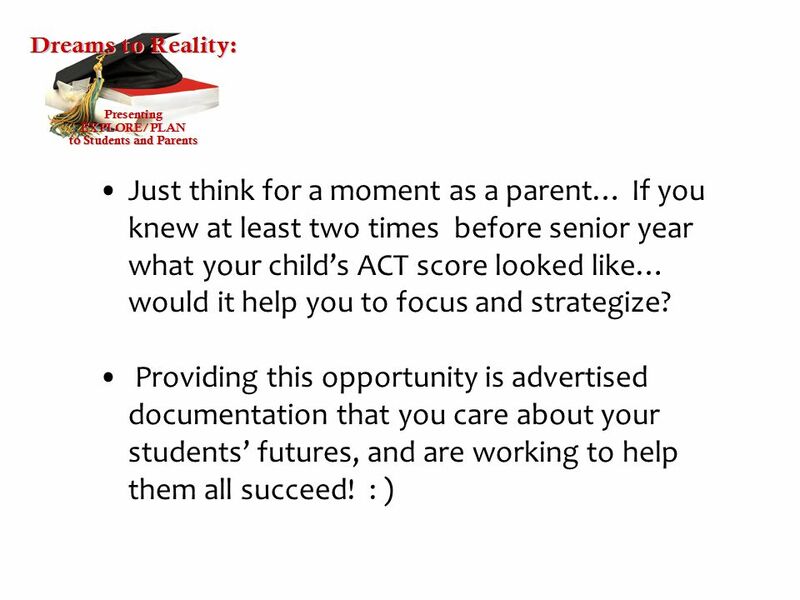 Your Estimated ACT score gives you an idea of where you MIGHT score on ACT, in 2 years, IF you keep doing what you are doing now in terms of course-taking, effort, and learning. If your Estimated Score is lower than you want it to be it is NOT carved in stone! Make choices that will increase that score, like challenging coursework, 100% effort, and doing extra activities to practice and prepare for ACT. 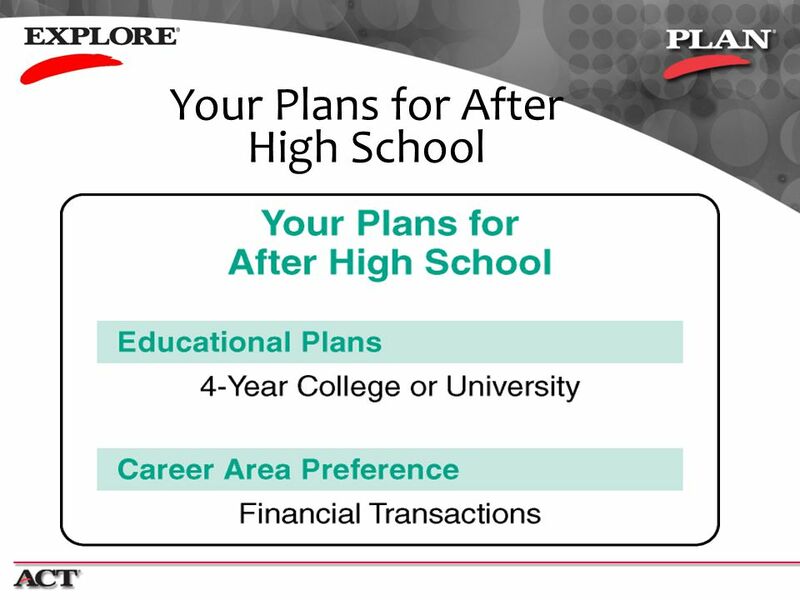 This block also indicates your plans for after high school, based on what you chose when you took the test. This block indicates what you said you plan to do after high school. 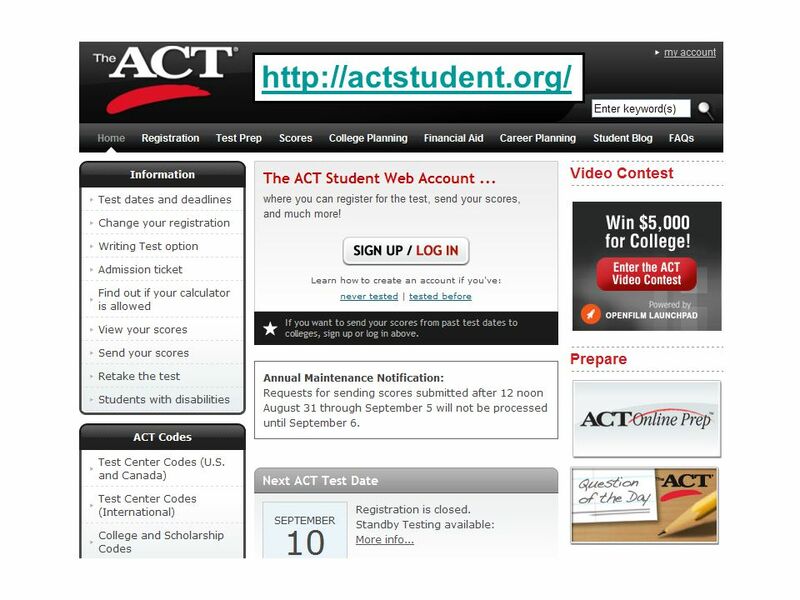 This block gives you information about what kinds of ACT scores are needed to get into different types of educational institutions, and what scores would indicate that you have a good chance of being successful in a college major that you chose from a list. If your actual score doesn’t match up well, don’t give up…just start doing the things you need to do to raise it and get prepared… Take challenging courses, give 100% attention and effort when you take the test, and do extra activities to prepare yourself not just for the test, but for the rigor of the courses you will take when you go to college! 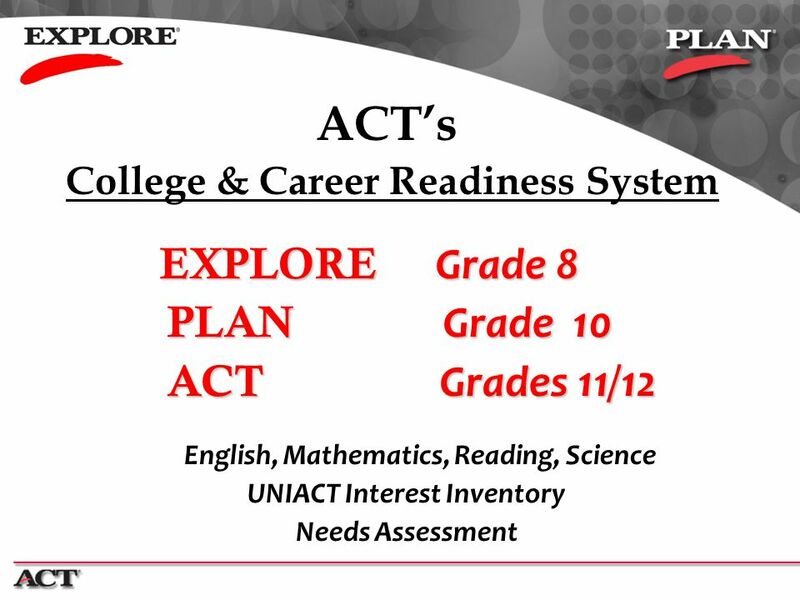 The black bars on this chart indicate the ACT Recommended Course pattern. This is the MINIMUM number of courses needed to be prepared for college. Many states require MORE than what ACT recommends! The gray line indicates the number of courses YOU said you plan to take in each subject. 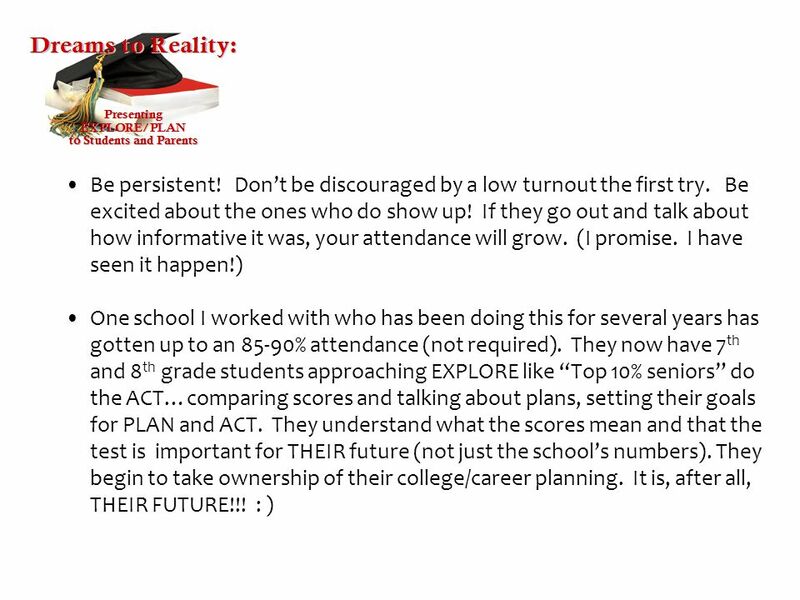 Make sure you understand what is required by your high school and your state to graduate! 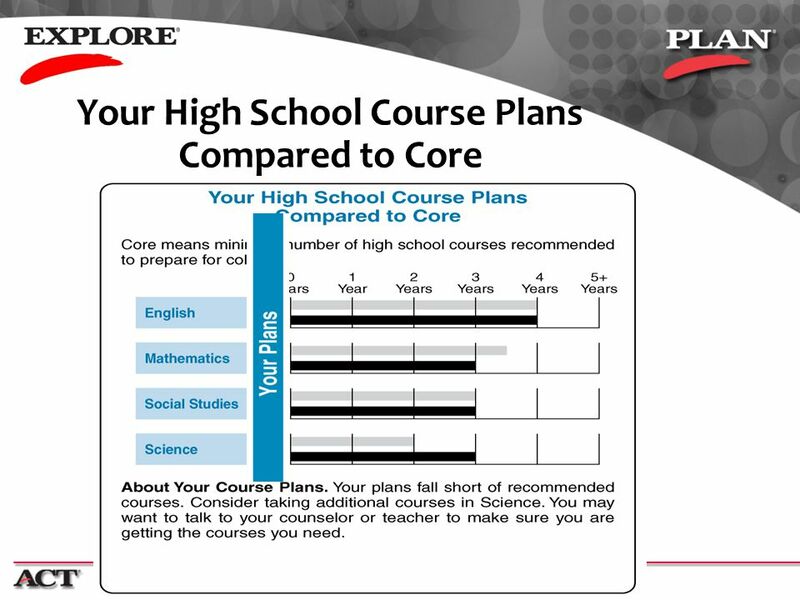 The College Readiness Benchmarks were determined through research, looking at over 150,000 college students across the country to see who got A’s, B’s, and C’s in Freshman Composition, College Algebra, an introductory Social Science course (History or Government), and Intro Biology. 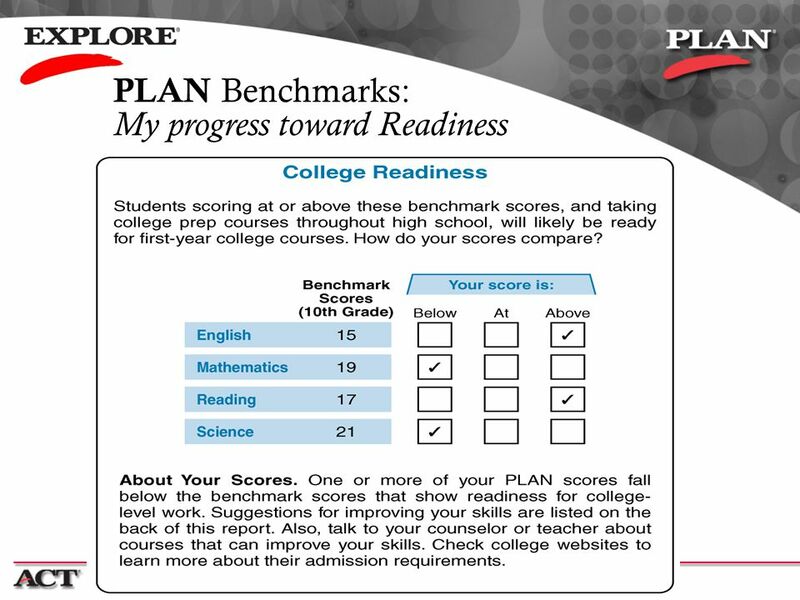 The benchmark scores represent what scores you should have in each subject area to be on track for college readiness. 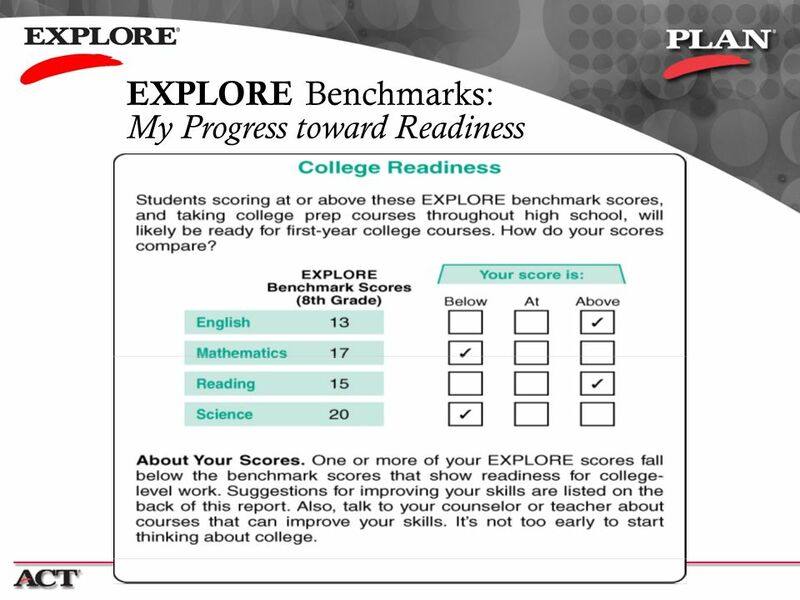 Compare your own scores (upper left corner) to the benchmarks. 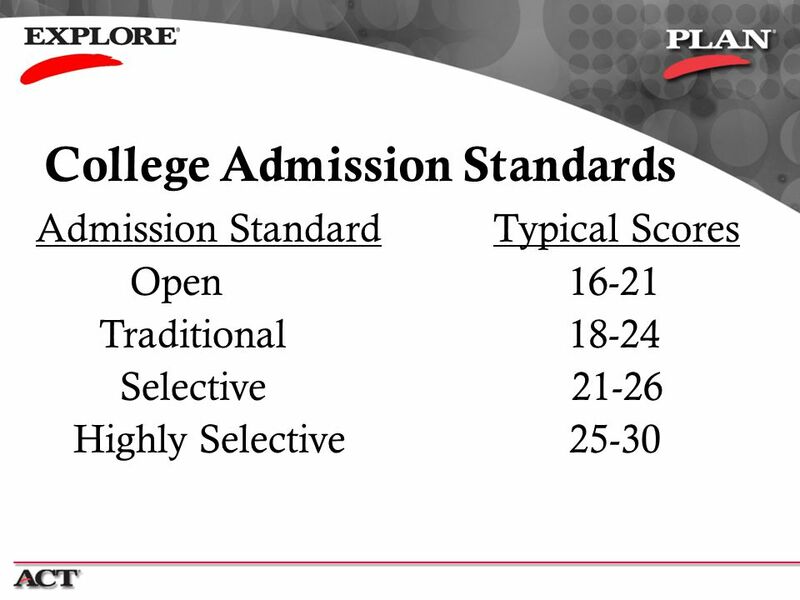 If some of your scores are lower, it doesn’t mean you can’t go to college. It just means that you have work to do between now and graduation. You can raise your scores by taking the right courses, working hard at your academics, and maybe doing some extra activities to prepare yourself. 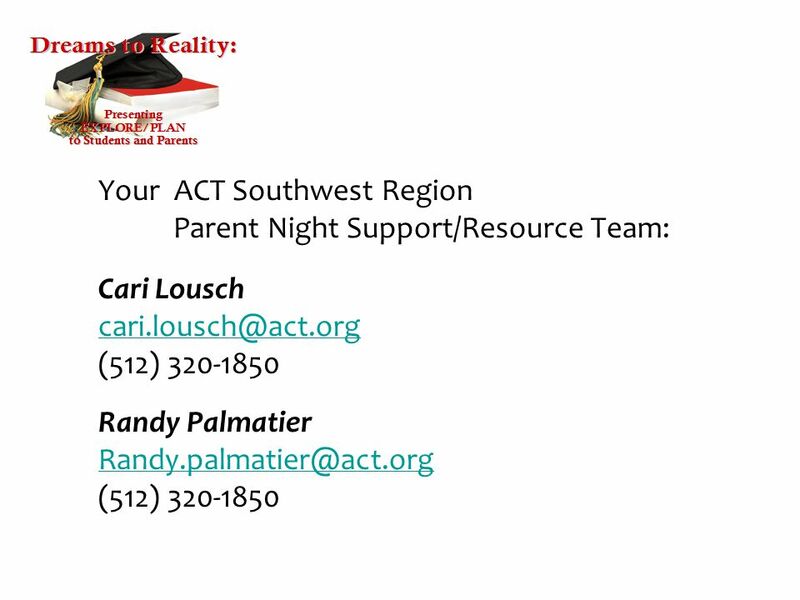 Ask your counselors and teachers for help now! You still have time to get yourself on track! If your scores are in the ‘above’ boxes that’s great! But it doesn’t mean you can stop taking those courses! Challenge yourself to do even better. Lots of scholarships ($$$) are tied to ACT scores. The higher you score, the more money you might get! 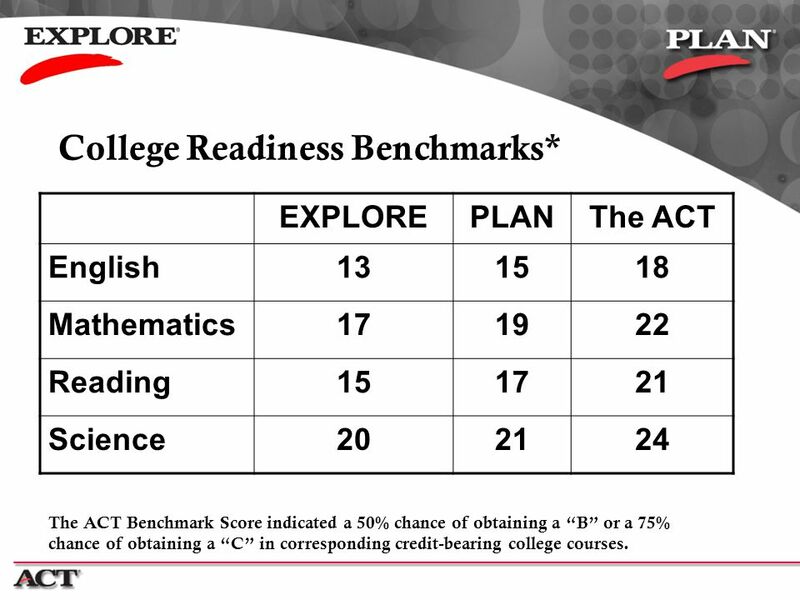 EXPLORE PLAN The ACT English 13 15 18 Mathematics 17 19 22 Reading 21 Science 20 24 This chart shows the benchmarks at each level. The numbers represent what scores you need to have at least a 50% chance of getting an A or B in the college class, and a 75% chance of getting at least a C. On average, students are expected to gain 2-3 points in two years, from EXPLORE to PLAN to ACT. If you are taking the tests in other grades, you can modify the scores by a point or point and a half to adjust. 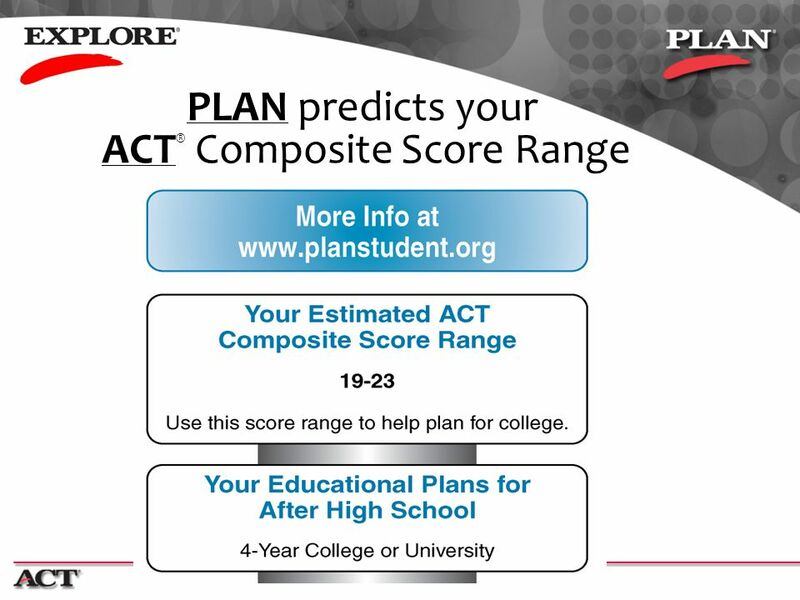 The ACT Benchmark Score indicated a 50% chance of obtaining a “B” or a 75% chance of obtaining a “C” in corresponding credit-bearing college courses. 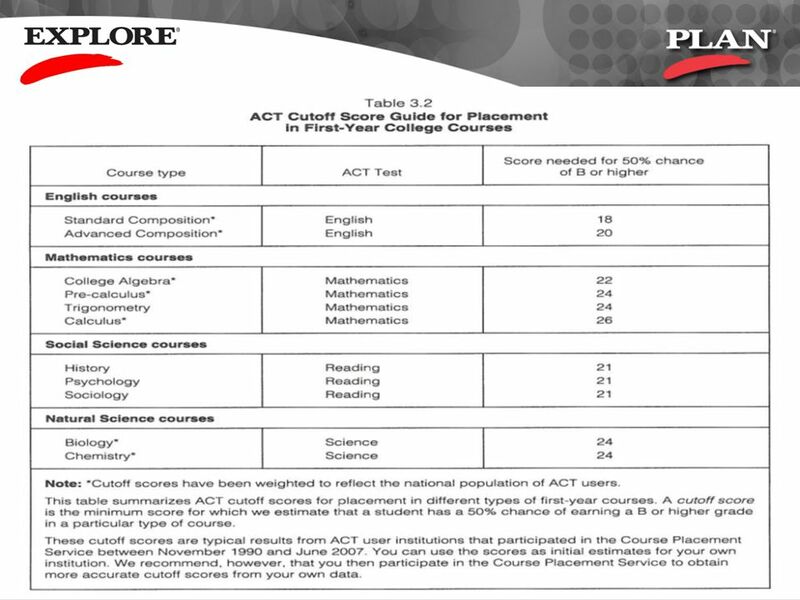 26 This chart shows the scores that ACT recommends for college to use in placing students in college English, Mathematics, Social Science, and Natural Science courses. For example, ACT recommends that students enrolling in a college Calculus course should have at least a 26 on the ACT Math test. 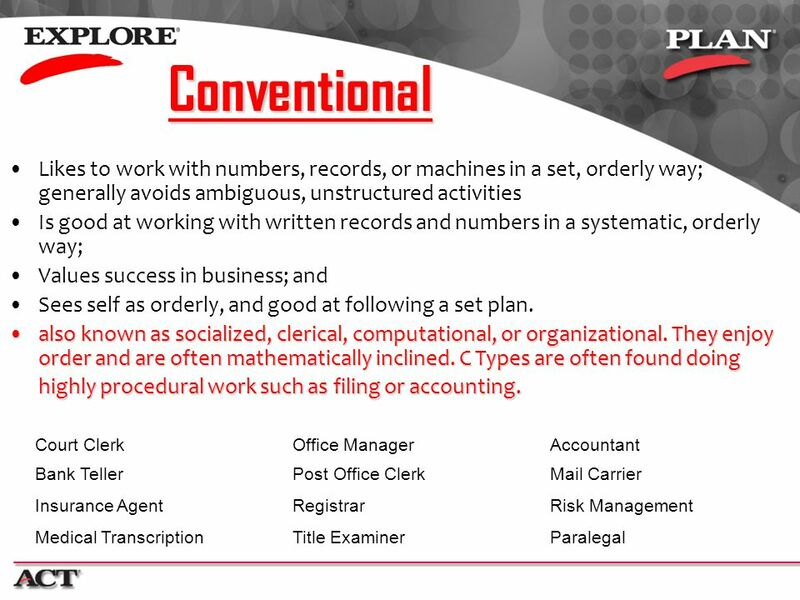 Every college has its own system and rules for placement, but many of them use this as a basis. 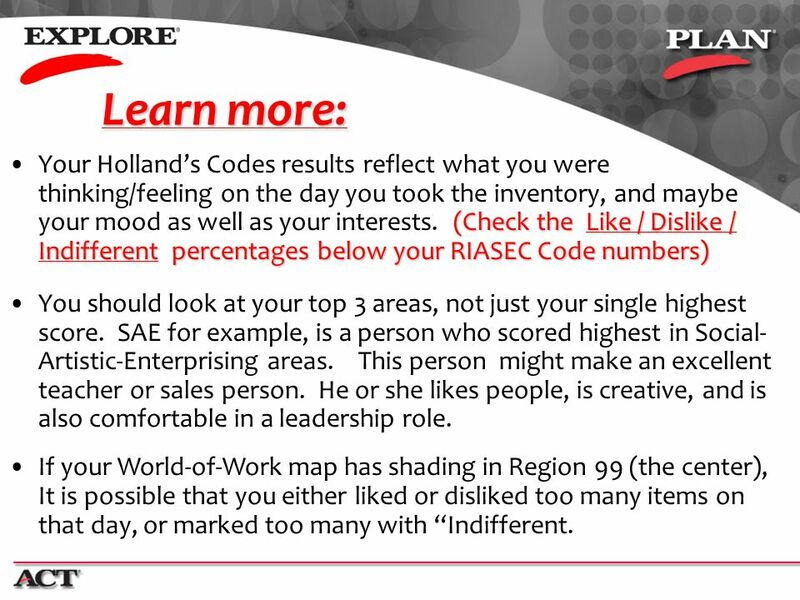 The World of Work map indicates where your “likes” and “dislikes” on the Interest Inventory part of the test said you fit best. Your wheel should have 3 shaded areas. If they are all touching each other, like this example, it means that you were pretty consistent in what you liked and that your interests fall into a focused area. 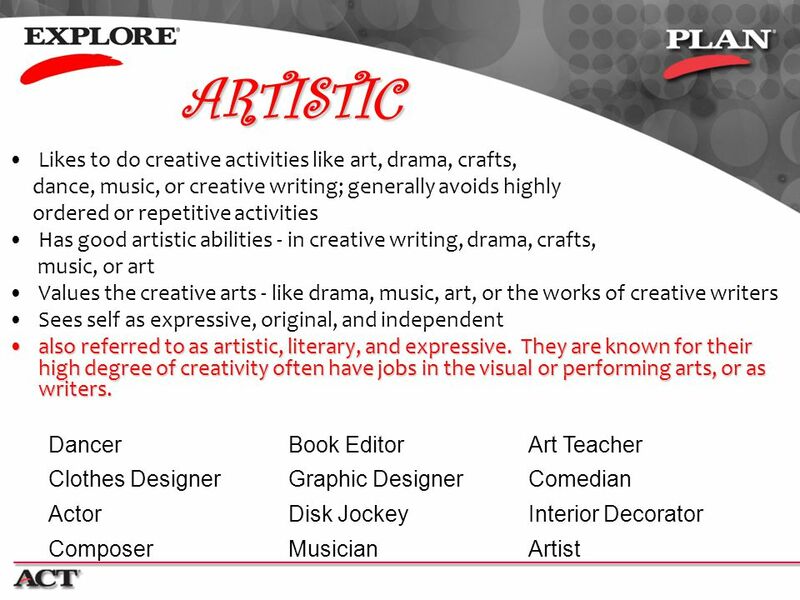 If your shaded areas are scattered around the wheel, it may mean that you have a wide range of interests. As you mature, you may focus in on a particular area, or your interest may remain varied. Some people will always have a wide range of interests and that is perfectly okay. 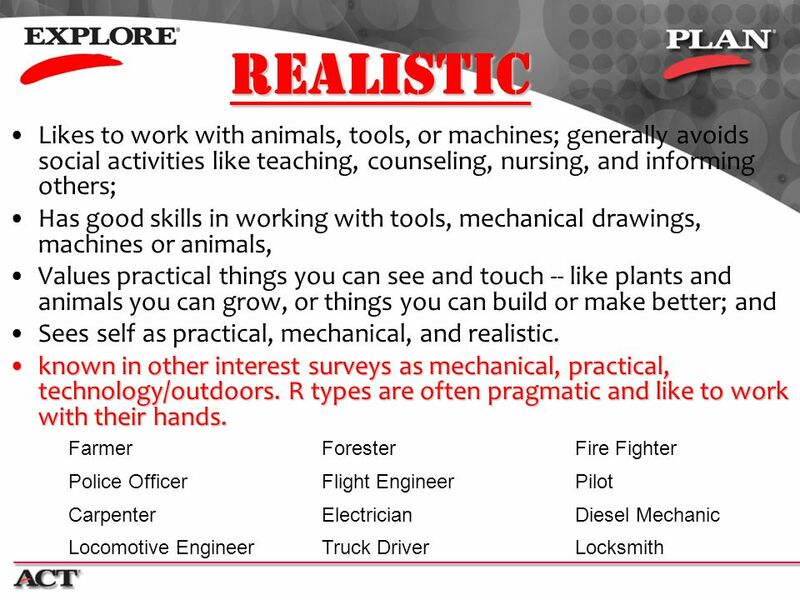 Most people will end up with one of those areas as a career field, and the others will remain as hobbies or side interests. Some people however, will find ways to merge their interests and make a living that includes them all! If your shaded area is in the middle…Region 99…it just means that on the day you took the test your choices made it difficult for the computer program to figure out what you really like most. Maybe you liked everything! Or maybe you liked nothing. Or maybe your interests were so equally spread out that it just couldn’t fit you into a category. There is nothing wrong with that, either. But to get better information next time you take one of these inventories, think hard about whether you truly like or dislike an activity, and try NOT to use indifferent anymore than you have to. 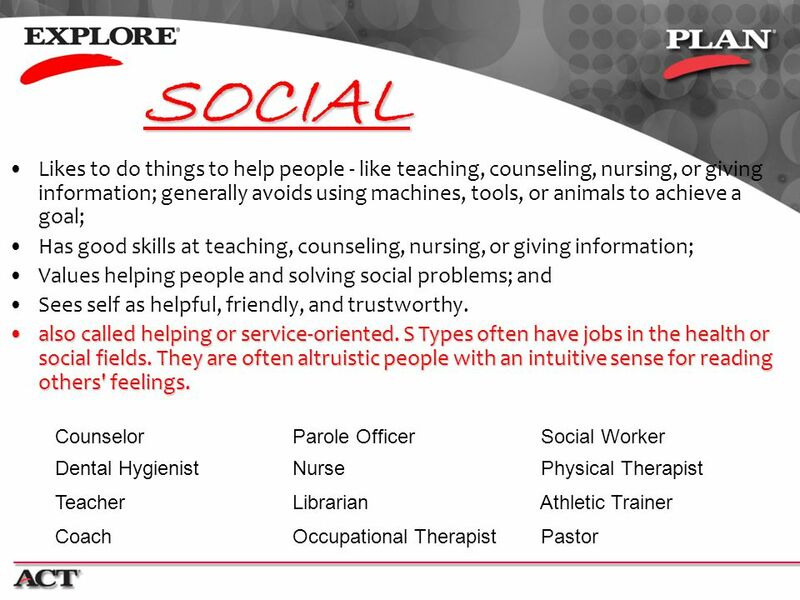 28 In the Information for Counselors block there is some really cool information about YOU. There are 6 letters with numbers beside them. 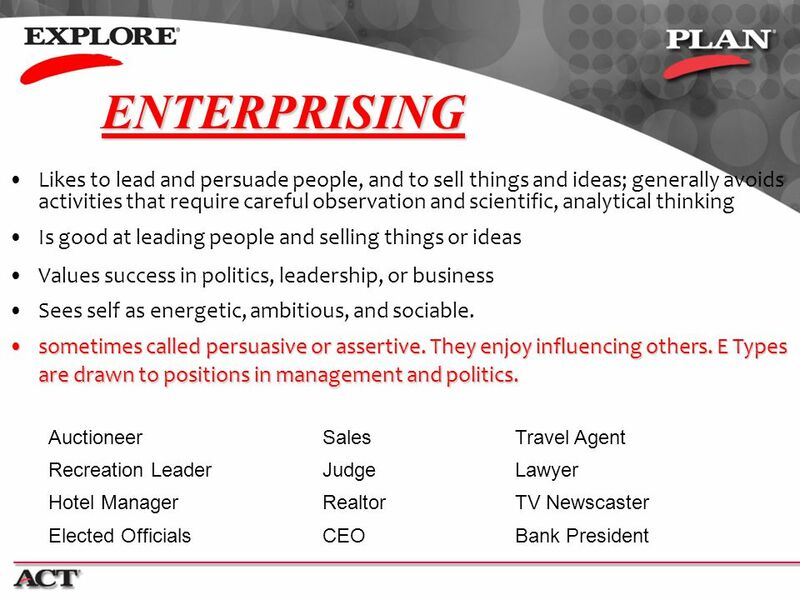 The following slides explain what those letters mean about your interests. 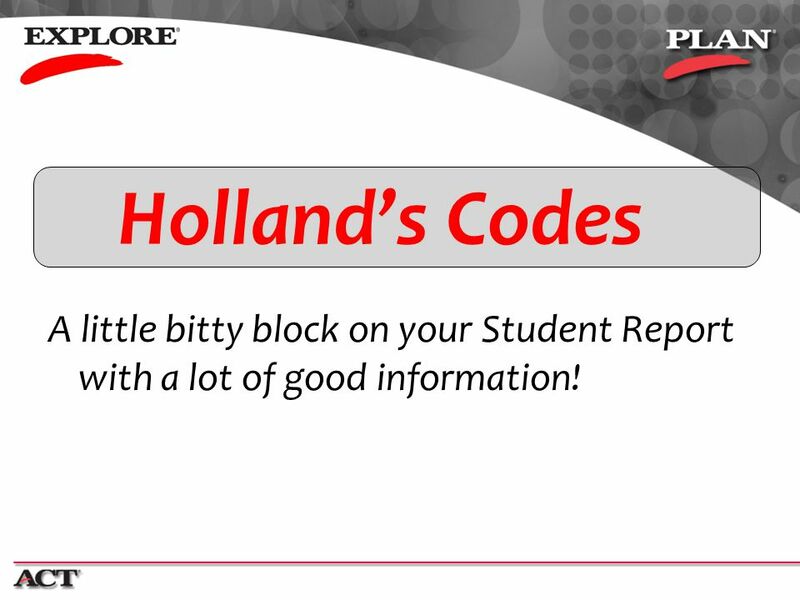 29 Holland’s Codes A little bitty block on your Student Report with a lot of good information! 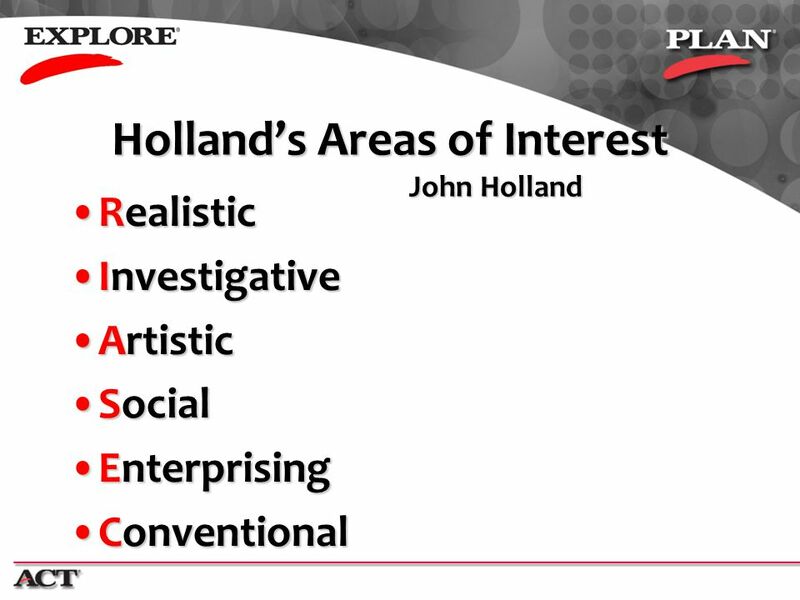 John Holland worked for ACT in the 1960’s, and developed some theories about personality that are still used and taught in Psychology classes today. 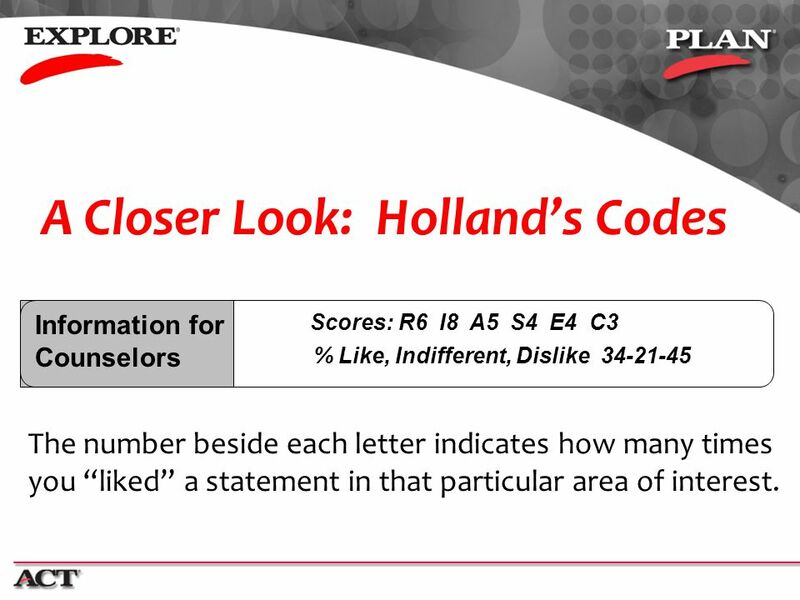 Scores: R6 I8 A5 S4 E4 C3 % Like, Indifferent, Dislike Information for Counselors Self-explanatory The number beside each letter indicates how many times you “liked” a statement in that particular area of interest. Realistic Investigative Artistic Social Enterprising Conventional These are the words that match the letters. I would dislike doing this activity……………………….. D I am indifferent (don’t care one way or the other)….…. 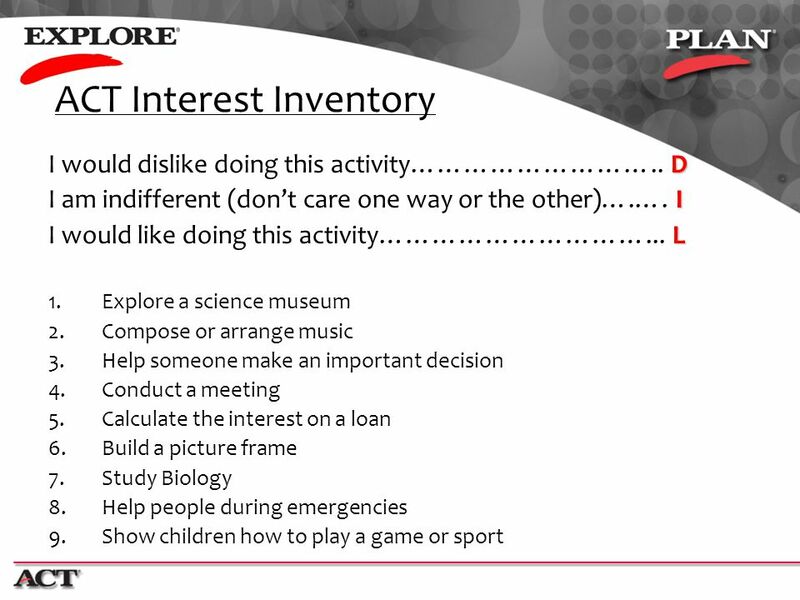 I I would like doing this activity…………………………... L Explore a science museum Compose or arrange music Help someone make an important decision Conduct a meeting Calculate the interest on a loan Build a picture frame Study Biology Help people during emergencies Show children how to play a game or sport This is what the Interest Inventory you took looked like. 42 EXPLORE Report Side 2 On the backside of your score report, you can actually see the question numbers, an answer key, and whether you got each question right or wrong. A plus sign (+) in the third column means you got the question correct. If you have a letter in the 3rd column, that is the incorrect answer that you chose. If you get your Test Booklet along with your report (counselor or somebody on your campus should have them), you can go back and look at the questions again. This is a really good way to improve your skills and score higher on an ACT the next time you take it. 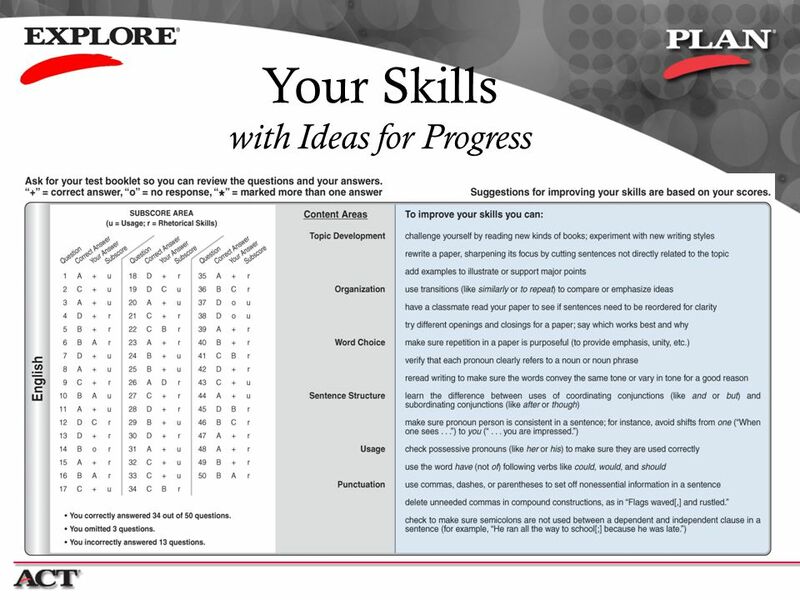 On the right side you have suggestions that will help you increase your score in each subject. These are matched with your own score, and are not exactly the same as everyone else. 43 PLAN Report Side 2 On the backside of your score report, you can actually see the question numbers, an answer key, and whether you got each question right or wrong. A plus sign (+) in the third column means you got the question correct. If you have a letter in the 3rd column, that is the incorrect answer that you chose. If you get your Test Booklet along with your report (counselor or somebody on your campus should have them), you can go back and look at the questions again. This is a really good way to improve your skills and score higher on an ACT the next time you take it. On the right side you have suggestions that will help you increase your score in each subject. These are matched with your own score, and are not exactly the same as everyone else. Close-up of the backside of your report. 49 To find out more about your scores, find practice questions, and research your World-of-Work information go to the EXPLORE Student website. 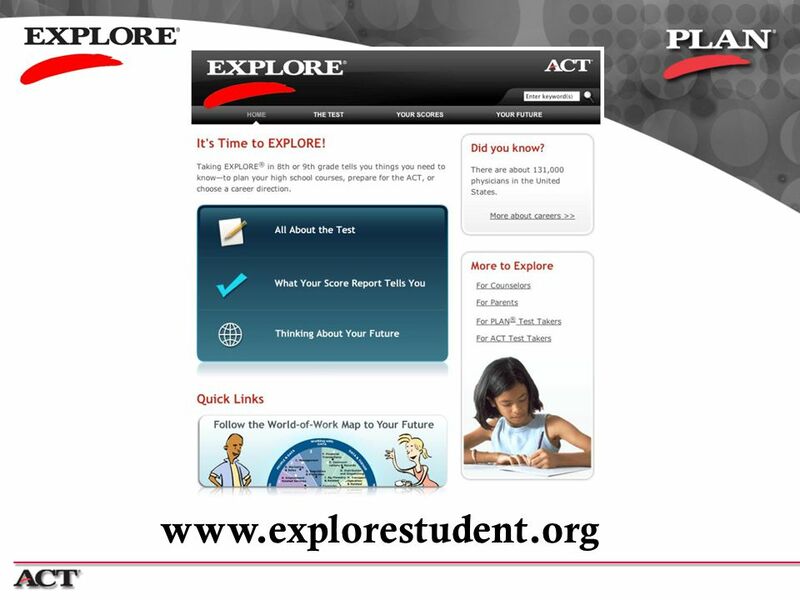 50 To find out more about your scores, find practice questions, and research your World-of-Work information go to the EXPLORE Student website. 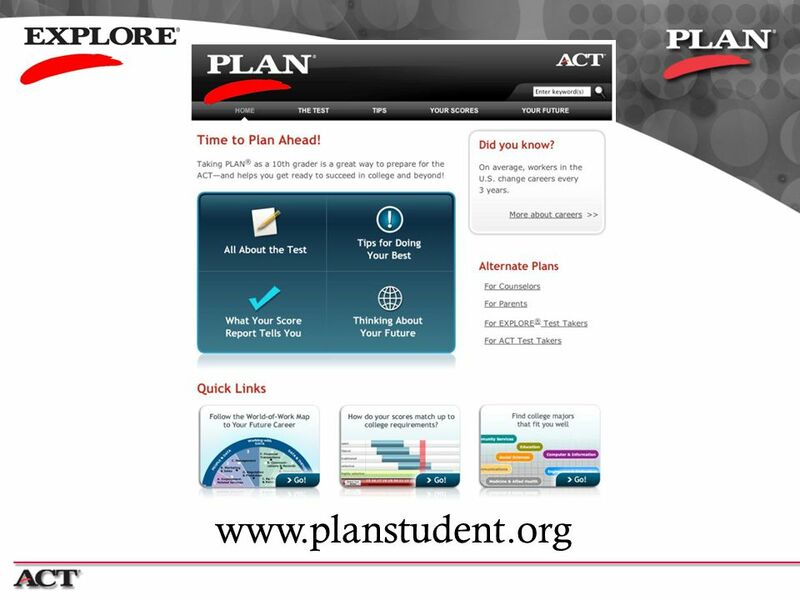 To find out more about your scores, find practice questions, and research your World-of-Work information go to the PLAN Student website. 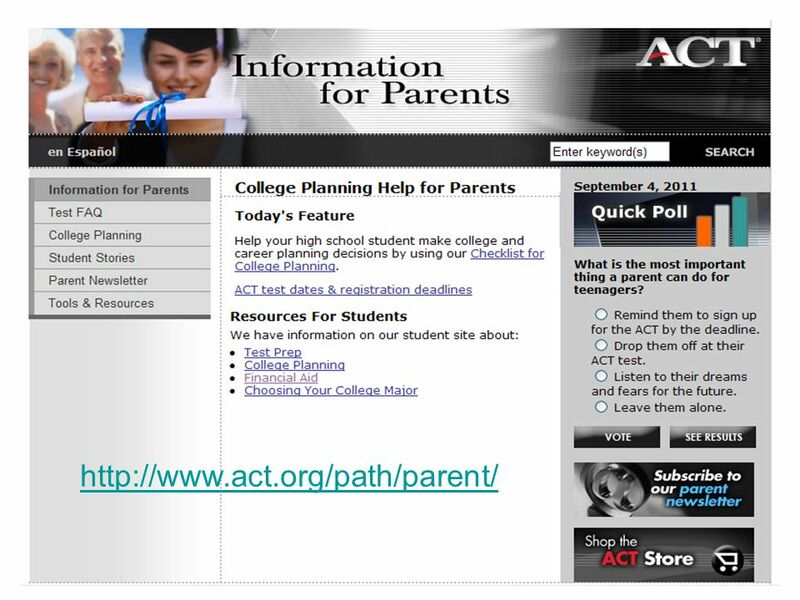 51 Parents can find out more about EXPLORE, PLAN, and ACT at the ACT Parent website, including tips on College Planning, Helping your child prepare for ACT and College, and a Parent Newsletter. 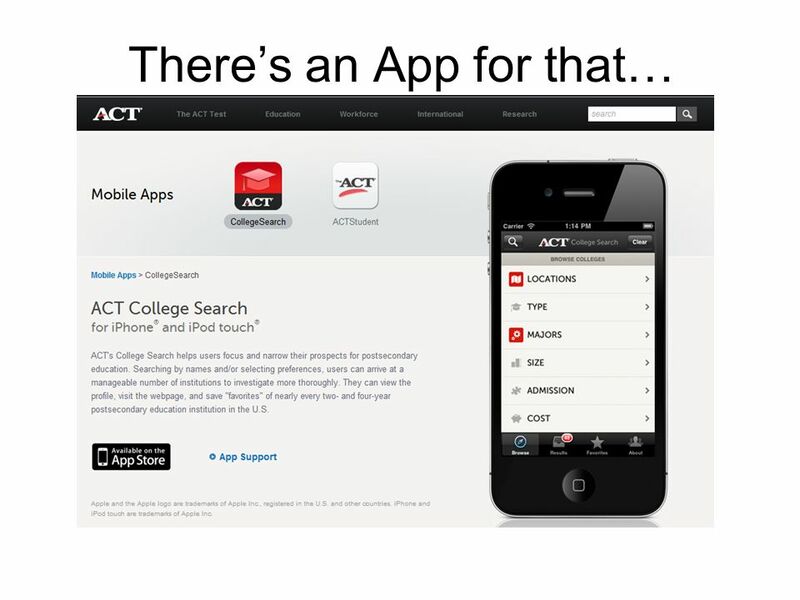 52 Students can create an ACT account at the student website. With a student account, you can register, check your scores, find practice questions, research colleges and careers, and lots more. 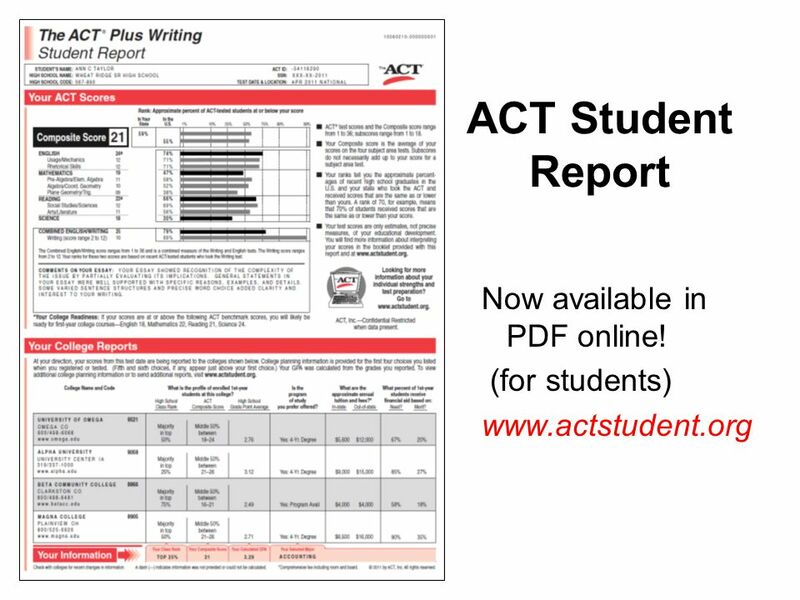 The newest feature of the student website is the ability to download your own student score report for ACT! This can save you and your counselor time when you begin putting together your college admission and scholarship applications! 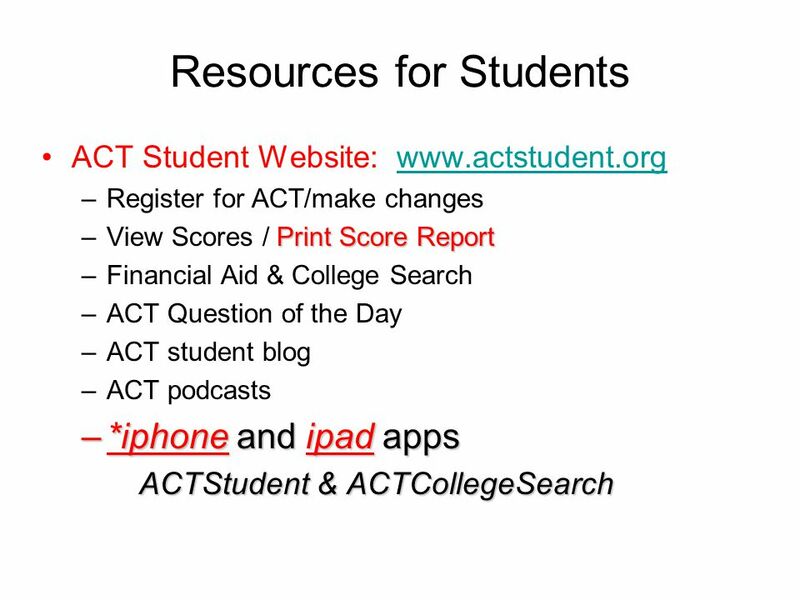 ACT Student Website: Register for ACT/make changes View Scores / Print Score Report Financial Aid & College Search ACT Question of the Day ACT student blog ACT podcasts *iphone and ipad apps ACTStudent & ACTCollegeSearch Here are the just some of the things you can do at the ACT Student website. 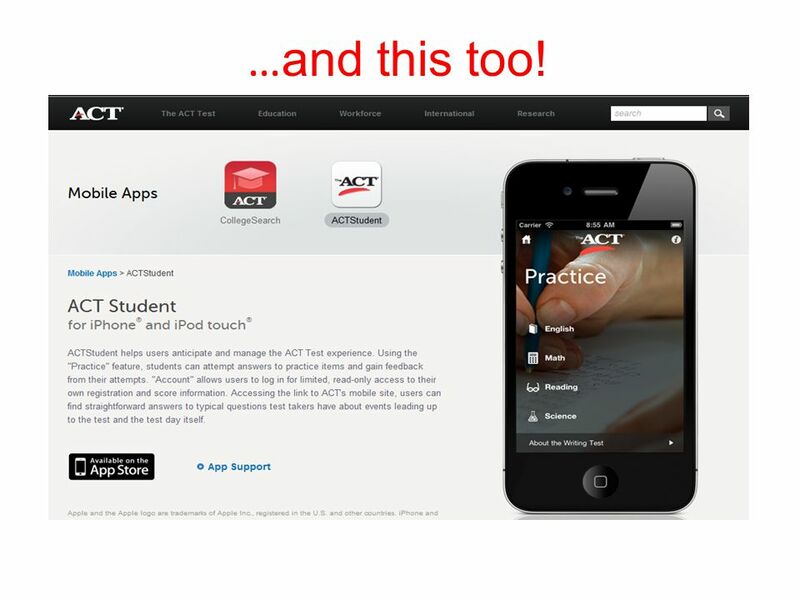 Check out the new iphone and ipad apps that allow you to register and check your scores from your phone, get the ACT Question of the Day, and more! 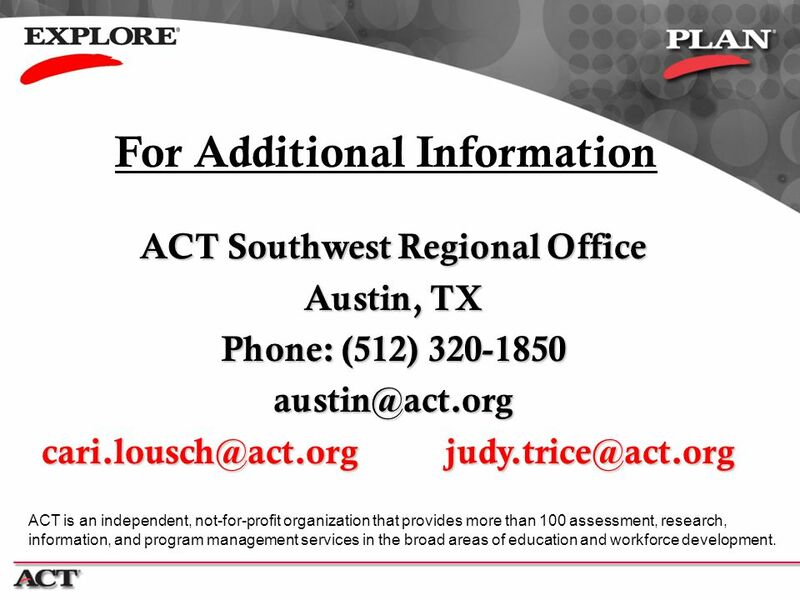 For Additional Information ACT Southwest Regional Office Austin, TX Phone: (512) ACT is an independent, not-for-profit organization that provides more than 100 assessment, research, information, and program management services in the broad areas of education and workforce development. 60 I. PREPARE A. Choose a date early 1. Make it part of a yearly calendar 2. 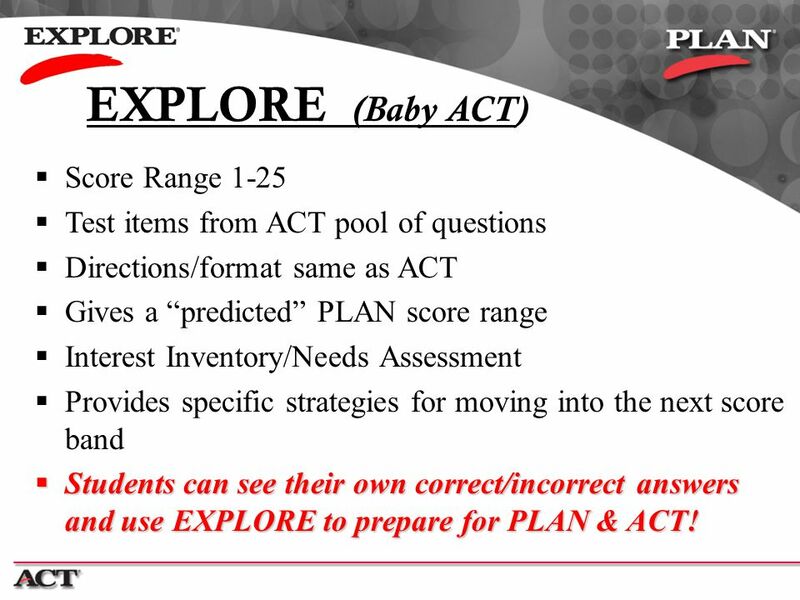 Plan it for 2-3 weeks after your EXPLORE/PLAN Testing date so your results will be available B. 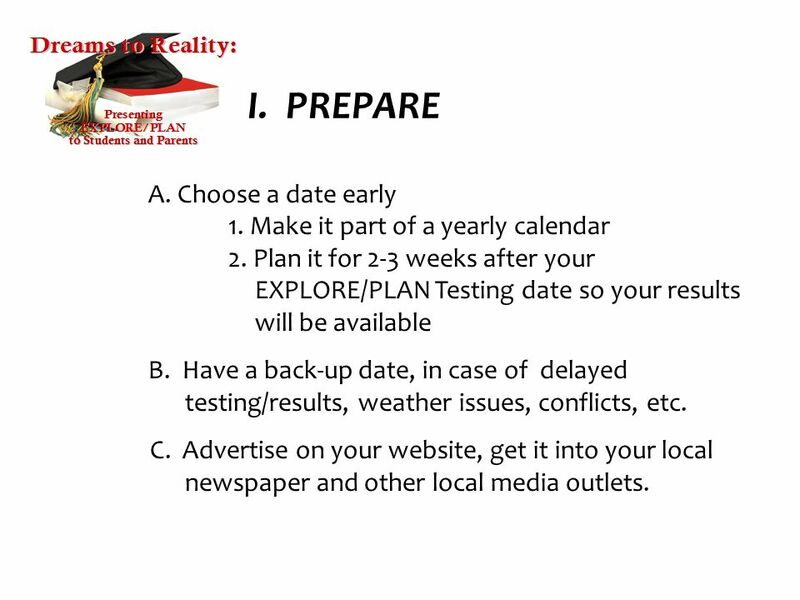 Have a back-up date, in case of delayed testing/results, weather issues, conflicts, etc. C. Advertise on your website, get it into your local newspaper and other local media outlets. 62 III. 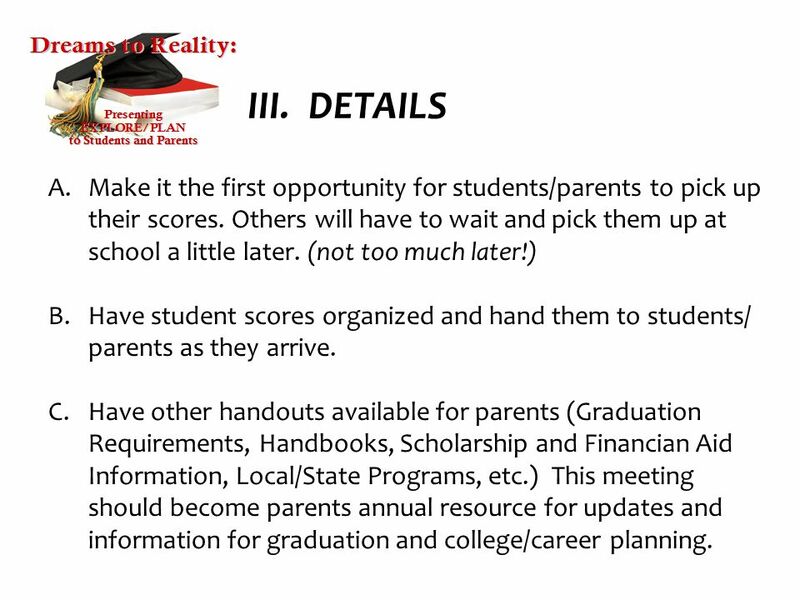 DETAILS Make it the first opportunity for students/parents to pick up their scores. Others will have to wait and pick them up at school a little later. (not too much later!) 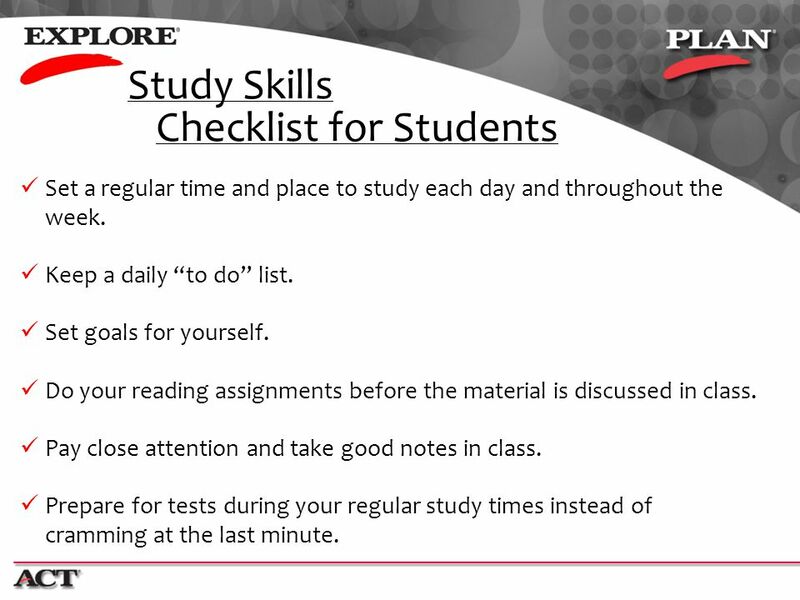 Have student scores organized and hand them to students/ parents as they arrive. 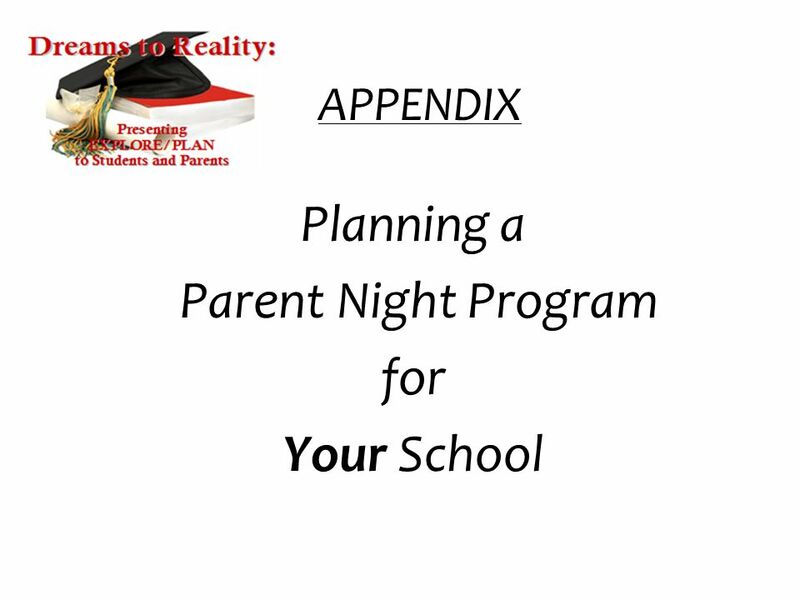 Have other handouts available for parents (Graduation Requirements, Handbooks, Scholarship and Financian Aid Information, Local/State Programs, etc.) 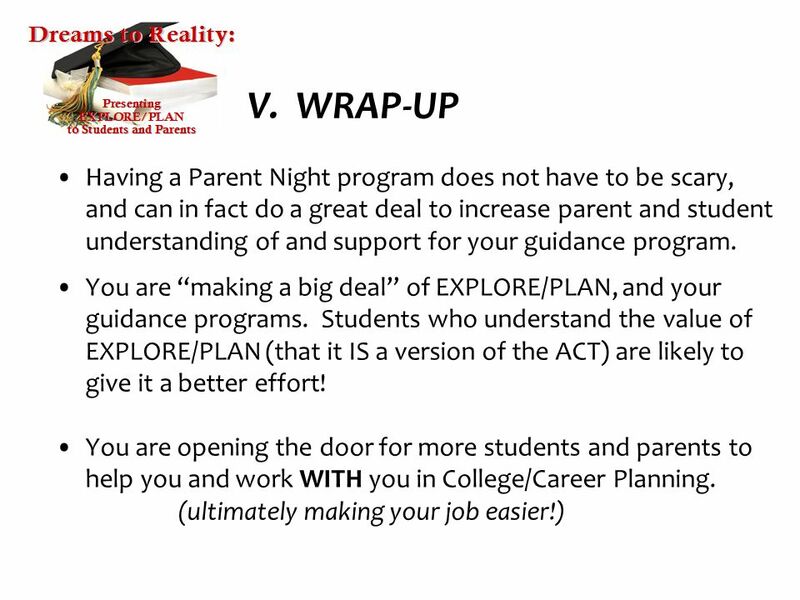 This meeting should become parents annual resource for updates and information for graduation and college/career planning. 63 IV. 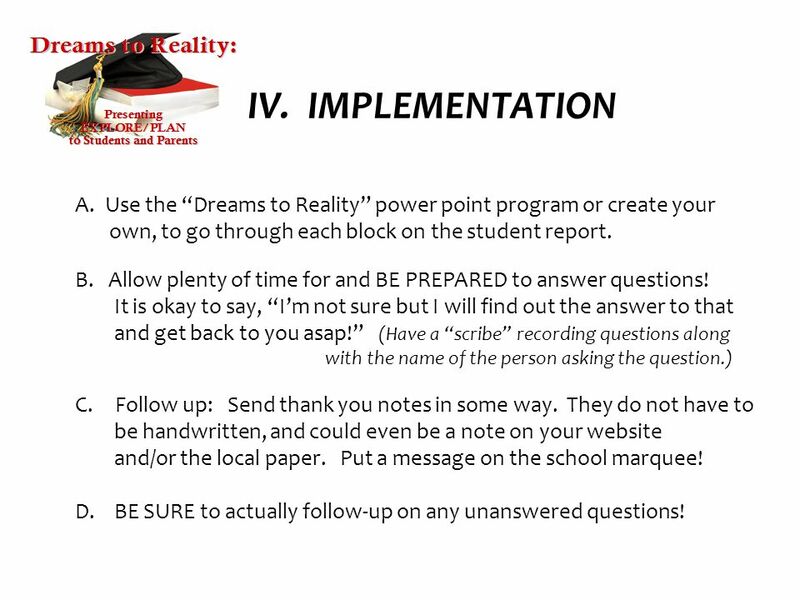 IMPLEMENTATION Use the “Dreams to Reality” power point program or create your own, to go through each block on the student report. B. Allow plenty of time for and BE PREPARED to answer questions! It is okay to say, “I’m not sure but I will find out the answer to that and get back to you asap!” (Have a “scribe” recording questions along with the name of the person asking the question.) Follow up: Send thank you notes in some way. They do not have to be handwritten, and could even be a note on your website and/or the local paper. Put a message on the school marquee! D. BE SURE to actually follow-up on any unanswered questions! 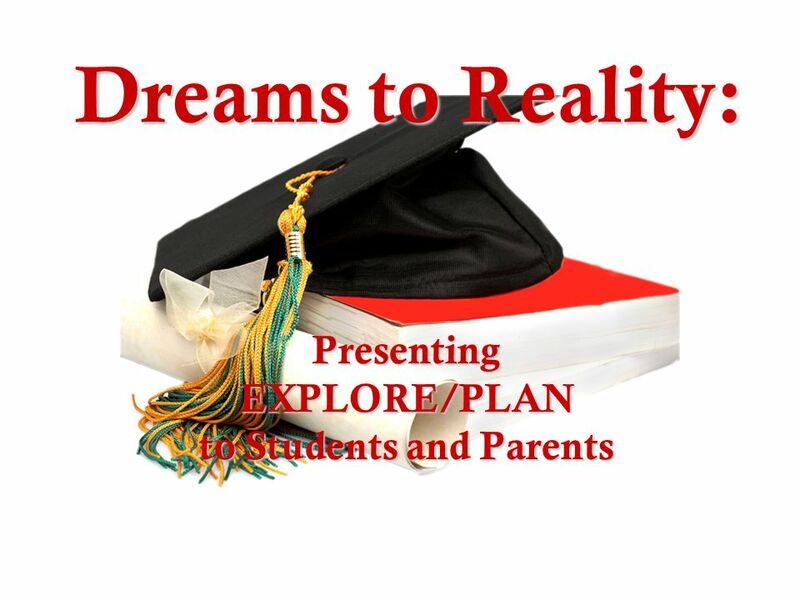 Download ppt "to Students and Parents"
Why Take PLAN? 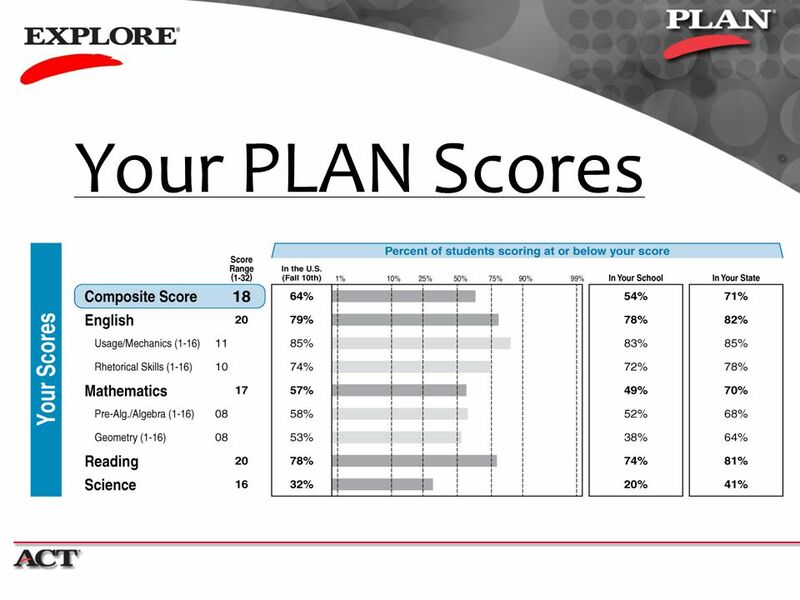 PLAN shows your strengths and weaknesses in English, mathematics, reading, and science. 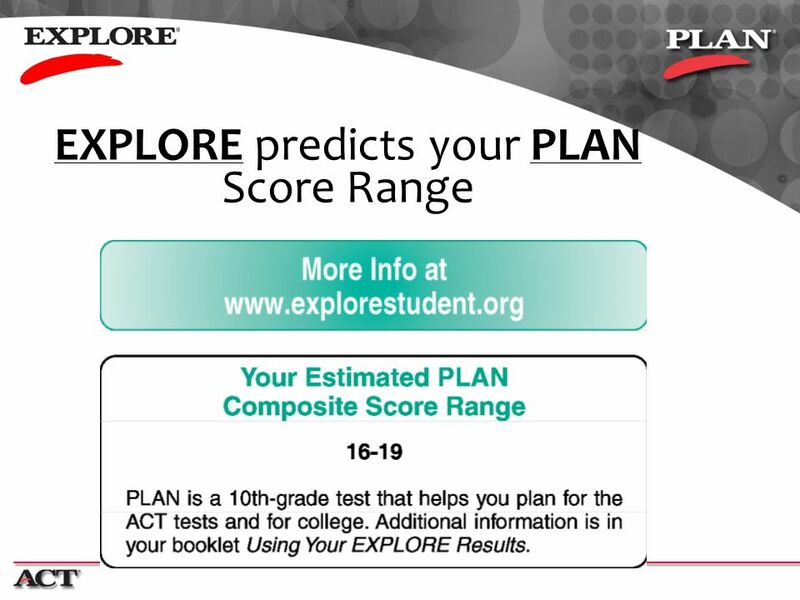 PLAN lets you know if you’re on target for college. Why Take EXPLORE? 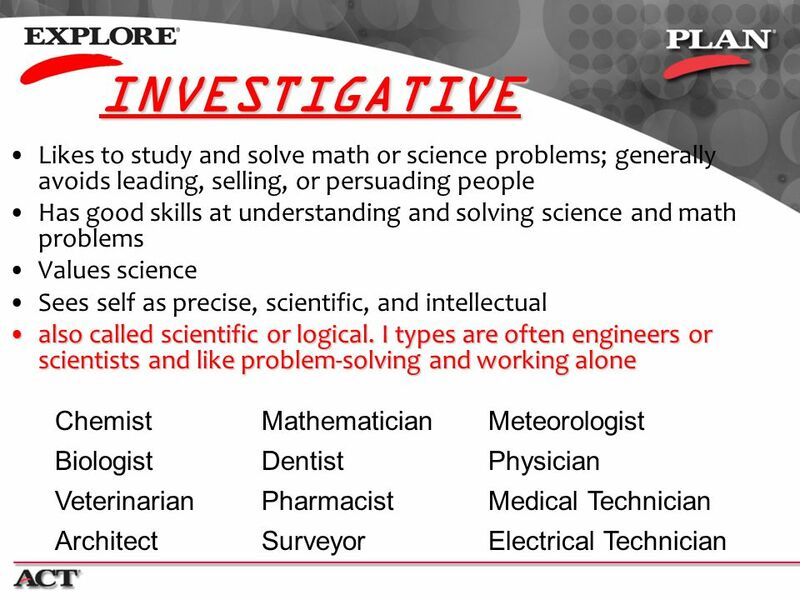 EXPLORE shows your strengths and weaknesses in English, mathematics, reading, and science. 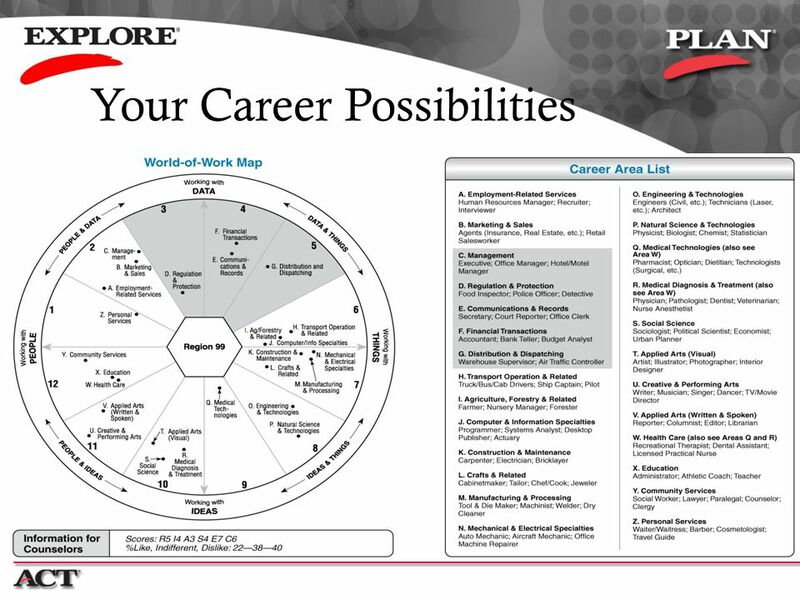 EXPLORE helps you search for careers and. Interpretive Visuals. 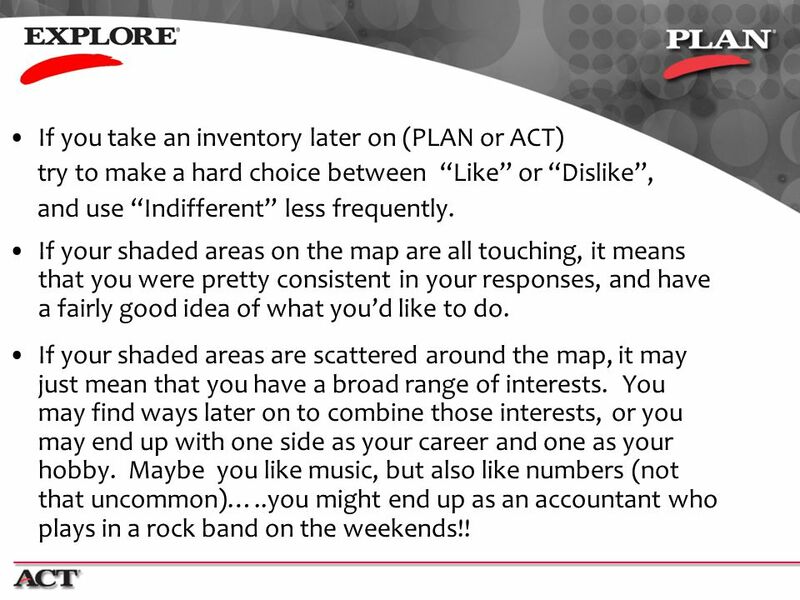 Understanding Your PLAN ® Results Preparing for Success 1 9/2010. 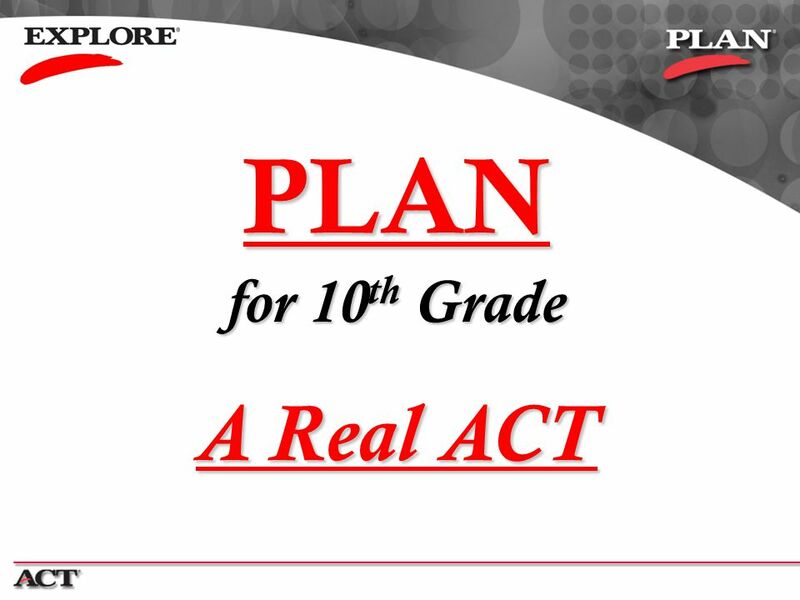 PLAN Results FALL PLAN Overview -I gave you back your score report, Using Your ACT PLAN Results booklet and your test booklet. The PLAN test is. 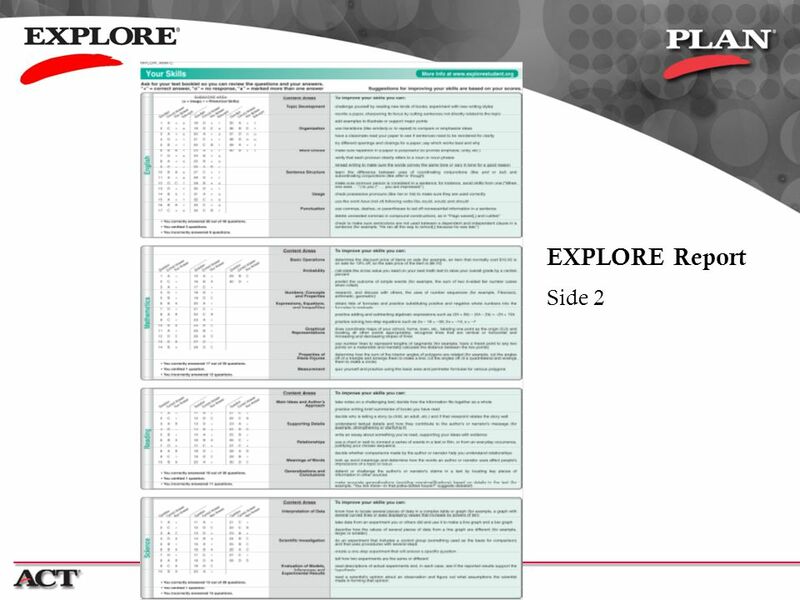 Using Your EXPLORE ® Results Student Guide to EXPLORE 3 9/2010. Self Assessments: Guidance To Your Career Path Office of Career & Transfer Services Harcum College. 7 th Grade PEP Career Exploration. 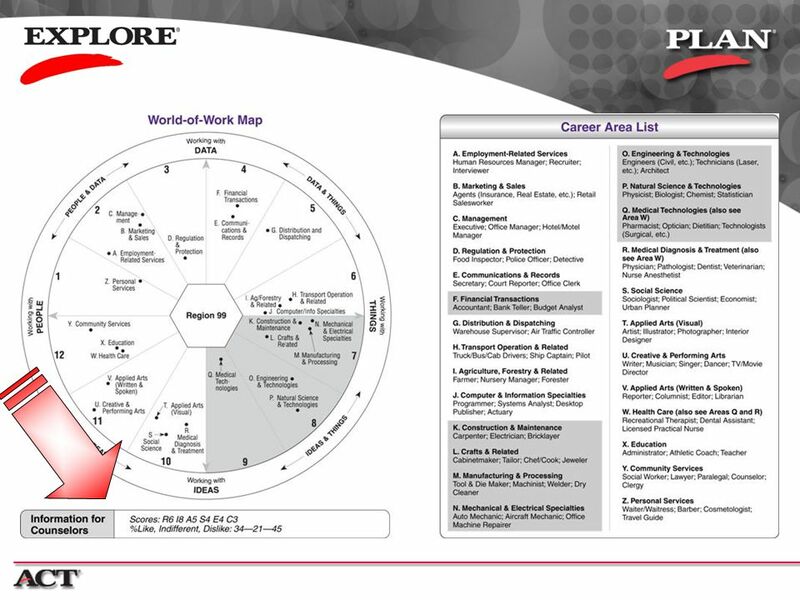 Overview 1.Review Holland Career Types 2.Complete College in Colorado Interest Profiler 3.Research career interests. Grade Point Average - Your grade point average (GPA) is calculated by dividing the total amount of quality points earned by the total amount of.